70.8 North, 69.2 East. It’s the Lat, Long coordinate location of a section of the Yamal Peninsula in Siberian Russia. A typically chilly region of frozen but now thawing ground more than 4 degrees of Latitude north of the Arctic Circle. A place that saw the appearance of odd, disturbing (and now controversial) methane blowholes pockmarking the melting permafrost during 2014. Today, the high temperature in a land now being forced to rapidly warm by human-caused climate change spiked to a tropical 80 degrees Fahrenheit (26.4 C) at 0800 UTC. Tomorrow, temperatures are expected to again rise to 80 F (26.5 C). And in the same location on Thursday, the mercury is forecast to strike close to 86 F (30 C). Across the Arctic Ocean at Latitude 71.4 North and Longitude 111.7 West, Canada’s Victoria Island is today also seeing temperatures spike to near 80 F (26.8 C). It’s a place encircled by sounds of wet crackling and fluid sighs. The mournful songs of melting sea ice. A sad threnody for the end of a much more stable and hospitable climate age. And there, and even further north to Banks Island, readings are expected to range from 80 to 82 F (26.7 to 27.7 C) on Wednesday and into Thursday. The heatwave in Northern Siberia comes on the back of new record high temperatures of 93 F (33.8 C) being reached in Buryatia on July 1 amidst record thunderstorm-induced downpours. The heat has since built northward along an extended ridge stretching over Central Asia and has now compromised a large section of the Arctic Circle zone. On the Canadian side, the odd warmth comes in the form of a weird Northern heat island. The heat near the Canadian Archipelago is surrounded by cooler regions north, south, east and west. The result of a heat dome high pressure ridge building in over this far Northern region during the coming week. Weather monitors like the Global Forecast System model show that both of these regions are in for some very severe Arctic heat over the next five days. High temperatures in the range of 80 to 86 F (26 to 30 C) are about 27 to 36 degrees Fahrenheit above average (15 to 20 C). Temperatures that will basically match those in Central America (8.3 N, 77.9 W) during the same time period. In other words, for these days and these regions, Arctic temperatures will roughly match tropical Equatorial temperatures. This most recent Arctic heatwave occurs in a climate context that, taking into account for 408 ppm CO2 alone will likely result in 1-2 C of additional global warming (on top of current approximate 1 C warming since 1880s) over the long term. Meanwhile, total CO2e (including methane and other greenhouse gasses) measures of about 490 ppm imply 1.5 to 3 C of additional warming long term (on top of 1 C current) even if the present total greenhouse gas forcing is only maintained (not added to by human beings or the Earth System). These are global averages. But all that extra heat forcing is causing the world to warm unevenly. As of 2009, the Arctic was warming up at a pace more than two times faster than the rest of the globe. And in the 40 year period from 1971 through 2011 NASA found that the Arctic had warmed about 3.55 degrees Fahrenheit while the rest of the world had warmed by 1.44 F. But that was before the big global heat spike during 2015 and 2016 further disproportionately heated the Arctic — pushing it into new record hot temperature ranges. In the end, it appears that the Arctic will eventually warm by about 2.5 to 3 C for every 1 C of overall global temperature rise. And the extreme heat we are seeing now in the Arctic is just a larger part of the geologically rapid warming trend now being driven primarily by human fossil fuel emissions. Impacts like loss of sea ice’s cooling albedo effect (reflectivity), loss of land albedo due to greening and loss of snow cover, and unlocking of local carbon stores due to rising heat, expanding fires, and changes in weather all contribute to this more rapid rate of Northern Hemisphere Polar warming. In addition, warming oceans, northward moving climate zones, and warm wind influx events generated by weaknesses in the Polar Jet Stream preferentially transport heat toward the Arctic (especially during Winter). These various forcings generate an overall greater degree of warming for the Arctic Ocean region during Winter all while Summer sees extraordinary heat racing to the Continental edges North of the Arctic Circle. The only effective way to slake this warming is to both halt human greenhouse gas emissions — which are the major driver of the big heat build up the world is now experiencing — as rapidly as possible while pursuing ways to remove the excess carbon loading from the Earth Atmosphere. Without these necessary responses and mitigations, more warming will continue to be locked into the pipeline and the greater the eventual temperature departure from 1880s (Holocene) values will ultimately become — with the Arctic increasingly entering a hot zone. What’s Causing the Poles to Warm Faster Than the Rest of The Earth? 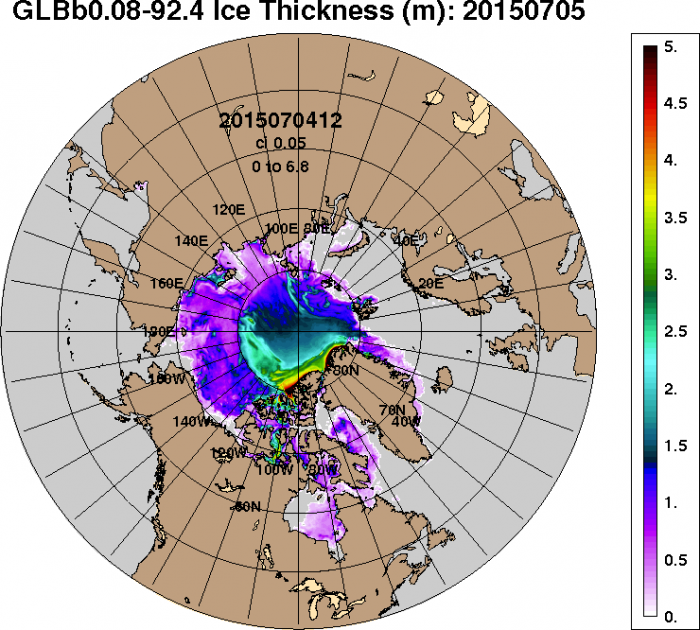 We’ve never seen Arctic sea ice extents that are as low as they are now in early June. And with Arctic heatwaves, warm winds, warm storms, and a Greenland High all settling in, something had better change soon or otherwise the ice cap over the northern Polar Ocean is basically screwed. On the shores of the Arctic Ocean’s East Siberian Sea (ESS), near the town of Logashinko, temperatures today are expected to rise to near 80 degrees Fahrenheit. Readings that are about 40 to 50 degrees (F) above normal for this near-polar region during this time of year. We would have never expected temperatures to have risen so high near typically frozen Logashinko during early June sans the heating effect of atmospheric CO2 levels that have this year peaked near 407.5 parts per million. The highest levels seen on Earth in about 15 million years. These scorching polar temperatures were driven north by a powerful high amplitude ridge in the Jet Stream that has dominated Eastern Russia for much of 2016 Spring. This expansive ridge enabled extreme wildfires popping up all over the region even as it today drives 80 degree weather all the way to Arctic Ocean shores — enforcing a regime of rapid sea ice melt over the East Siberian Sea. As the warm winds drive northward across ice-clogged Arctic Ocean waters, temperatures rapidly fall into 35 to 41 degree (F) ranges. 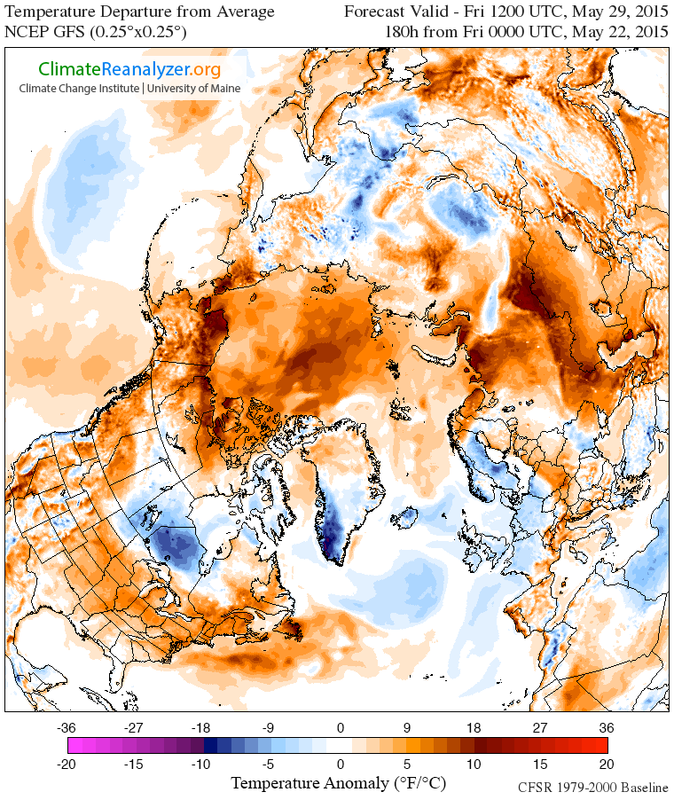 And though that may sound cool to the casual observer, for the East Siberian Sea zone during early June, that’s scorching hot — topping out at more than 10 degrees above average for some areas. A pretty extreme variation for late Spring when temperatures over the Arctic Ocean only typically depart from average by about 3 or 4 degrees at most. 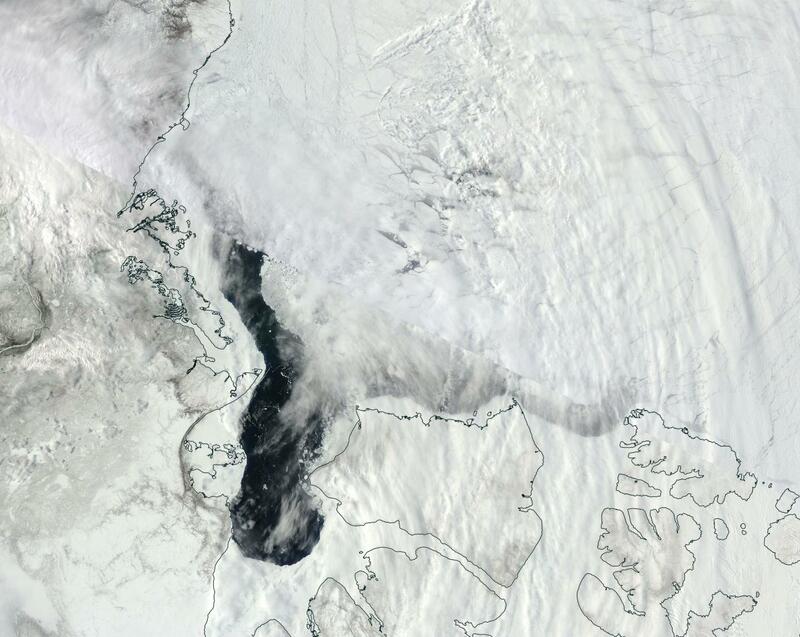 All across this Arctic Ocean region, melt ponds and widening polynyas now abound in the ridiculously warm airs. In the satellite shot above, the tell-tale bluish tint of the ice reveals a plethora of these ponds expanding northward through the ESS and on toward the pole. A flush of hot water running into the Arctic Ocean from East Siberia’s rivers is melting the near shore ice. 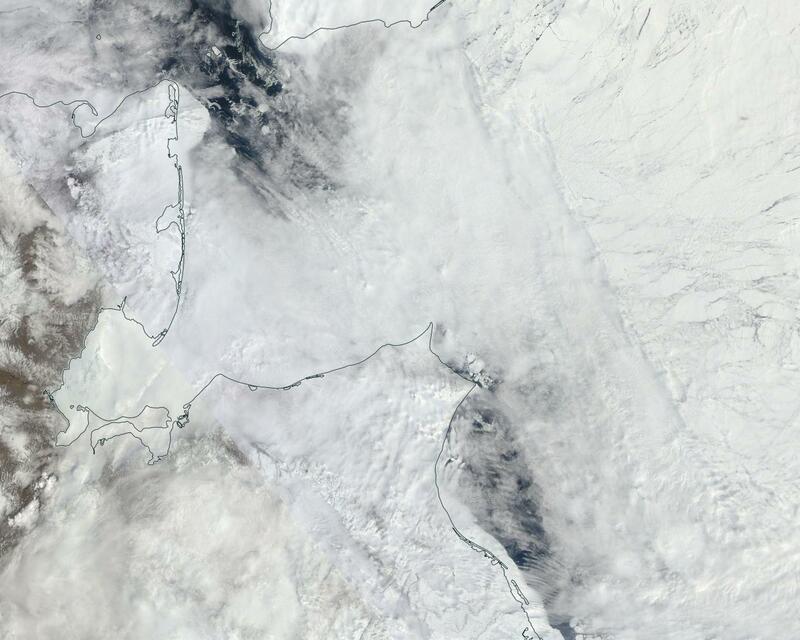 And a giant 80 mile wide gap of open water has now been torn into the ice of the Laptev Sea. The sudden Arctic heatwave and rapid related melt involvement of the ESS and Laptev is just the most recent melt spike in a polar ocean that sees ice extent levels hitting new record lows with each passing day. 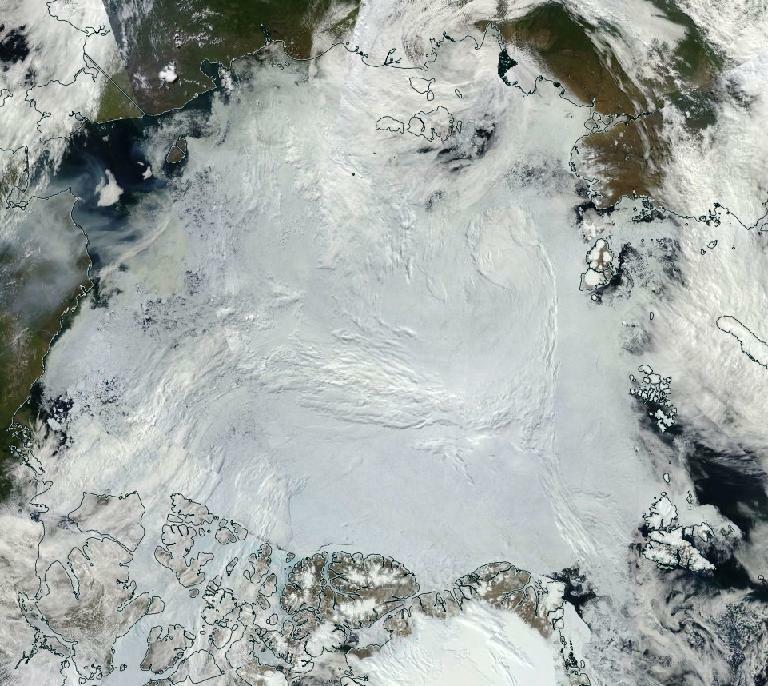 As of June 2nd, the expanse of Arctic Sea ice only measured 10.37 million square kilometers. This is about 430,000 square kilometers below the previous daily record low set just last year and fully ten days ahead of the record sea ice melt year of 2012. A coverage of sea ice that is now 42 days and 2.1 million square kilometers of sea ice loss ahead of an average melt year during the 1980s. Extreme heat building into the Siberian side of the Arctic and record low sea ice extent measures are today being joined by yet another disturbing Arctic feature. For as of yesterday, a strong ridge of high pressure began to form over Greenland, the Canadian Archipelago and Iceland. Greenland highs tend to increase temperatures over the enormous glaciers of that frozen island even as the clockwise circulation pattern of an anticyclone tends to shove sea ice out into the Barents and North Atlantic. The dominance of a Greenland High during both 2012 and 2007 is thought to have heavily influenced record end season sea ice melts during those years as well as the extreme Greenland surface melt spike during 2012. This week’s predicted ridge formation is not expected to bring with it a severe surface melt of Greenland. However, the clockwise winds driving sea ice transport may serve as yet one more heavy blow to the already greatly weakened ocean ice. Pressures later this week are expected to rise to 1040 mb over Greenland. And strong winds running between powerful warm storms expected to form in the Kara and Central Arctic are predicted to rise to near gale force north of Greenland — generating a risk of a very vigorous ice loss from the near polar zone as floes are driven into warm Barents and North Atlantic waters. In context, the combined severe record sea ice lows and emerging weather conditions represent a seriously bad state for Arctic sea ice. One with a high risk of continued further extreme losses and new daily record lows for at least the next seven days. It’s worth re-stating. The Starks were wrong. Winter isn’t coming. Winter, as we know it, is dying. Dying one tenth of a degree of global oceanic and atmospheric warming at a time. Steadily dying with each ton of heat-trapping greenhouse gasses emitted through our vastly irresponsible and terrifyingly massive burning of fossil fuels. According to UCAR reanalysis, it’s something that’s only happened three times during December in the entire temperature record for the North Pole since the late 1940s. Four times now that a record warm surge of air hit that highest point of Northern Hemisphere Latitude during late December of 2015. An event that was influenced by the very destructive Winter Storm Frank. A combination of weather variables that, by themselves, was odd and rare enough. But what may be about to happen next week is even more rare. Because we’ve never, not once, seen this kind of heat set up at the North Pole during January. Disturbingly, what we’re seeing now starting to take shape is another warm air invasion of the Arctic with the potential to bring above-freezing temperatures to the North Pole during the long polar night. An odd and highly abnormal event that may again take place this Winter in just a few more days. If it does happen it will be yet another case of a never-before-seen warming event occurring in a record hot world. 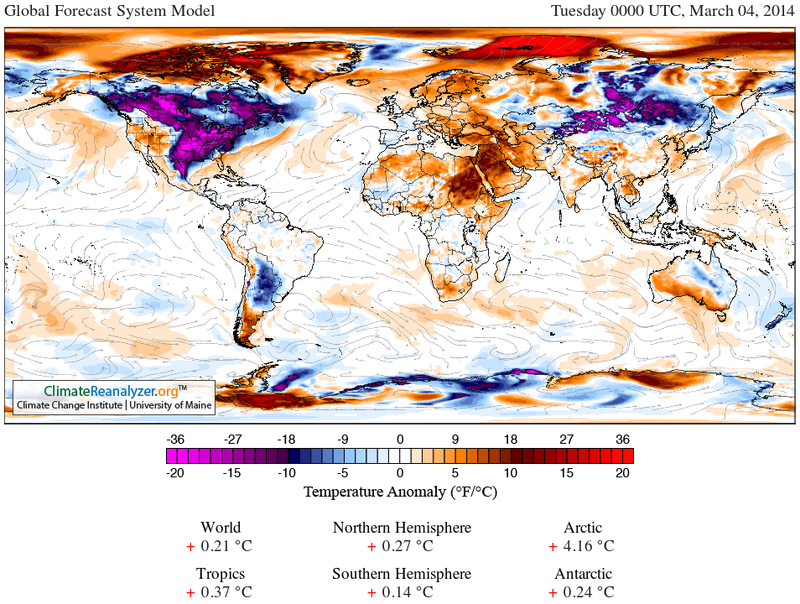 According to Global Forecast Systems model reanalysis by Earth Nullschool, it appears that a record warm Earth atmosphere and ocean system is again taking aim at the High Arctic. Another synoptic daisy chain of storms funneling warm, south-to-north winds — dredging them up from the tropics, flinging them across thousands of miles of North Atlantic Ocean waters, driving them up over Svalbard and toward the North Pole — is predicted to set up by early morning Monday. The anchor of these dervishes of Equator-to-Pole heat transfer is the very Winter Storm Jonas that just crippled the Eastern US with record snowfall amounts and storm surges that have beaten some of the highest seas seen during Superstorm Sandy. A second, hurricane force low in the range of 950 mb is predicted to set up between Iceland and Greenland. But the tip of this spear of record atmospheric heat pointed directly at the Arctic is a third, but somewhat milder 990 mb, storm. And it is this northern low that will draw a leading edge of record warmth into the Arctic. An anomalous, ocean-originating heat front that will spread its pall of air warm enough to melt sea ice during Winter north of Svalbard tomorrow. A swath of near and above-freezing temperatures spreading inexorably Pole-ward. Reinforced by the supporting lows and the synoptic wave of warmth in train, this storm is predicted to drive near or slightly above freezing temperatures into the region of 90 North Latitude by late Tuesday or early Wednesday. An event that would be unprecedented, at least in modern meteorological reckoning. One that may well be unprecedented for the whole of the Holocene. To put such extraordinary temperatures into context, this predicted record polar warmth is in the range of 55 degrees (F) above normal for January. And for such a typically frigid region, these temperatures are more usual for June, July, or August. Or, to make another comparison, for Gaithersburg, Maryland it would be like seeing readings above 94 degrees (F) for the same Winter day. A summer heatwave in the midst of what should be a season of cold. That’s what’s predicted for a region that will not see a single ray of sunlight until April. Heat trapping gasses with the ability to re-radiate the sun’s energy in the dark of night or in the depths of Winter are now having a profound impact on our world. It’s something that should really be keeping us up at night. At the very least, it’s something that on Tuesday may push the North Pole up above freezing on a, black as night, January day. There’s a massive heat dome building over an Arctic sea ice pack that is looking increasingly fragile in both model forecasts and observations. In short, very bad weather for sea ice is rapidly settling in even as the ice pack, despite recent place gains in some measures, is looking increasingly weak. First the somewhat good news… Arctic sea ice extent has backed off to about 8th lowest on record. Arctic sea ice area is at about 4th lowest on record. And Arctic sea ice volume, according to DMI, is in the range of 3rd lowest on record (PIOMAS looks even better). This report may sound rather bad, but when compared with late May and early June when sea ice extent measures were at or near new record lows the data could arguably be characterized as an improvement. Yeah, there’s been some big area drops recently, but all in all, not too terrible, right? …However, there is one big difference compared to last year and that’s heat. Despite a very cold start, there have been several outbreaks of warm air over the ice, slowly but radically shifting the balance between extent and area data. The impact is felt on the surface of the ice pack, but doesn’t translate directly into a decrease. Not yet. In theory, it should percolate through after a while, especially if the heat persists. And right now the Arctic sea ice pack is undergoing a massive heat wave which shows no signs of letting up. I find myself in agreement with Neven. The massive heat build in the Arctic predicted for this week is likely to be a significant event with potentially wide-ranging impact. But to understand why, it helps to get an overall picture of the broader context in which this particular heatwave is occurring. And that context includes two other stories as well — the story of human-forced climate change and the story of a still developing and potentially monstrous El Nino. Our particular heat transporter should by now be very familiar — a ridiculously resilient ridge (RRR) — extending northward and buttressed by multiple high pressure cells stubbornly entrenched over abnormally hot water in the Eastern Pacific. Yesterday (Monday, July 6) the ridge elongated. South to north winds over-riding northward flowing warm, salty ocean water. Running up through Alaska, the heat pulse set off all-time daily highs in places like Anchorage (81 degrees and breaking the record set in 1972). The heat then spilled into the Bering, Chukchi and Beaufort Seas where it met with adjoining, though lesser heat pulses over-riding Greenland and the Laptev. A gathering pocket of hot, thick air that is now pooling in the so-called sea ice ‘safe zone’ just north of Greenland.’ A precursor to the very intense high pressure cell we see developing now. Taking a look at NOAA’s July 6 Sea Surface Temperature Anomaly (SSTA) map, we find a massive plume of much warmer than normal (1971-2000) waters extending up from a plainly visible El Nino pattern, all throughout a large sweep of the Eastern Tropical Pacific. Moving northward, these steamy waters spill into two hot blobs off the Mexican, US, and Canadian coasts — a heat pool that again punches up through the Chukchi and Beaufort Seas. An Equator to Pole expanse of ominously hot water that is enabling both sea ice melt in the regions directly impacted as well as a broader invasion of warmth into even the sea ice’s most secure haunts. Warmth that today aided in the formation of an Arctic high pressure ridge hitting significant heights of 1030 to 1035 mb directly between the Pole and Greenland. At 1245 Eastern Standard Time, the ridge had already intensified to 1032 mb. And for at least the next seven days both the GFS and the Euro model shows a 1025 to 1035 mb high pressure cell dominating the same region. This persistent ridge will remove cloud cover in a large area between North America and the Pole. Sunlight, at its seasonally most intense, will multiply already widespread melt ponds on the sea ice surface. The combined solar forcing and loss of albedo will push surface temperatures higher as the ridge remains in place. And by Friday a broad band of 2-4 C temperatures is predicted to form in a bulge over the Arctic Ocean north of Greenland and the Pole. Abnormally warm temperatures and direct sunlight that will, over the next week, increase melt pressure over the last remnant of thick sea ice left to the Arctic. In addition to reducing cloud formation and enhancing the melt-forcing impact of sunlight on the sea ice, high pressure cells in this region will have a couple of further influences. First, they will tend to compact the sea ice overall — drawing in the fringe ice while generating warm water upwelling at the ice edge. And second, the clockwise motion of air circulating around a strong high pressure cell will nudge sea ice out of the Central Arctic toward the gateway of the Fram Strait. Add in the significant impact due to reduced cloud formation allowing sunlight to contact sea ice during a period of peak solar radiative forcing and we end up with a substantial overall blow to the sea ice. Taking a look at the meteomodel anomaly map above, we find a very extreme warming of the Central Arctic predicted over the next ten days. A heat pulse to rival 2012 for this period. A melt multiplying heatwave that is predicted to push anomalies for the entire Arctic above +1.5 C beyond the early July average. A polar amplification similar to what is typically a winter manifestation of human emissions-driven anomalous warmth — this time anomalously occurring during a period when heat for the region is approaching peak intensity. In the face of this oncoming weather, ice pack strength would be a deciding factor lending resiliency during melt-promoting conditions or a shift to a much more rapid rate of decline. Though some indicators, including a seemingly slower rate of decline during late June, may point toward more ice resiliency, a growing number of satellite reports and model analysis hint at a general and overall weakness throughout the ice pack. This weakness can best be described as model indication of thin or low concentration ice, already widespread melt ponding, and visual indication of ice weakness in the satellite shot. For low concentration ice, no model is more stark than the US Navy’s experimental GLBb sea ice thickness ensemble. 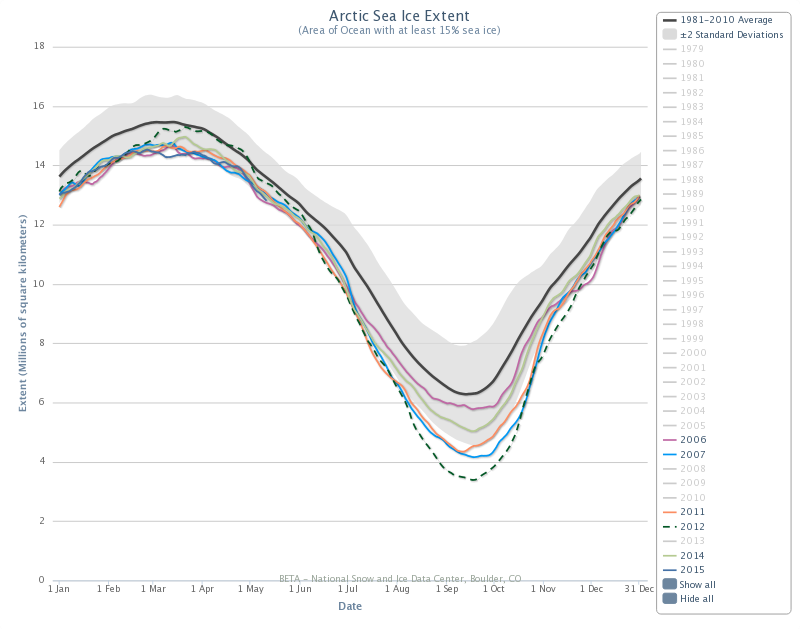 I colloquially think of this as the ‘holy crap’ sea ice model. This label due to the fact that if sea ice state is really as bad as the model indicates, then the ice is basically toast. Starting in June, this model displayed a great overall weakness in the sea ice and, according to its analysis, the situation has progressed from bad to worse with most of the remaining Arctic Ice possessing a thickness of 1.2 meters or less. Easily thin enough for any nudge by weather to really start rapidly bringing the ice down and opening up very large expanses of open ocean. The top image in this up and down comparison shows the US Navy’s ARCc model’s interpretation of sea ice concentration for July 6 of 2015. 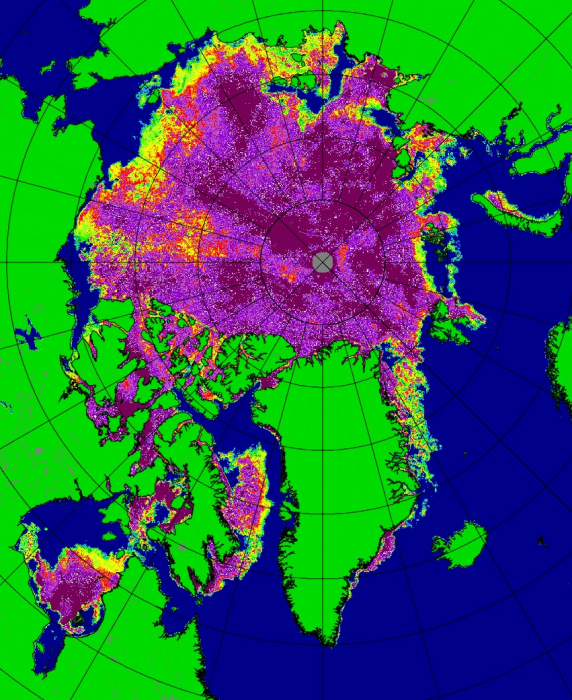 Note the extensive green regions showing a 40-50 percent sea ice concentration. It’s a huge swath of ice including large sections of the Chukchi, the Beaufort the ESS, the Laptev, as well as remaining ice in the Kara Sea, and Baffin and Hudson Bay. Now watch what happens to those large sections of lower concentration ice from July 7 to July 10 in the ARCc model 30 day history and forecast summary. Almost all that green is wiped off the map. It’s like losing about 1 million square kilometers of extent and 600,000 kilometers of area in just 72 hours. Or about 10,000 square kilometers of ice per hour. A precipitous fall that would mark an extraordinary and likely unprecedented rate of loss should it emerge as the Navy model predicts. But you know what they say about models — no model is perfect and every model ends up wrong in some manner or another. So the question here is — how likely is it that the Navy models could be correct or incorrect this time? The left image in the above comparison is from the AMSR2 model analysis for Arctic sea ice concentration on July 5. The right image is the same analysis but for July 6. Note the substantial change in the sea ice concentration for the Beaufort and Chukchi seas over just one day. A change that is consistent with the pulse of warm air and water riding up through the Eastern Pacific and through Alaska, the Bering and the Chukchi. Another holy crap moment, and not at all of the good variety. To say the least, a similar response north of Greenland and the CAA would be devastating. Moving away from models and back to observations we find that from the satellite vantage the entire Arctic Ocean displays an ice pack in various shades of azure. By color analysis alone we can readily see that the 2015 ice (July 6 MODIS image) is far more melt pond embedded than 2014 or 2013. 2012 is a tough comparison due to NASA-MODIS’s format change from that year. But the widespread melt ponding alone hints at a reduced resiliency for the ice when compared with recent years. Turning to the Chukchi and Beaufort, we see a visible confirmation of the weakness indicated in the US Navy and Uni Bremen models. 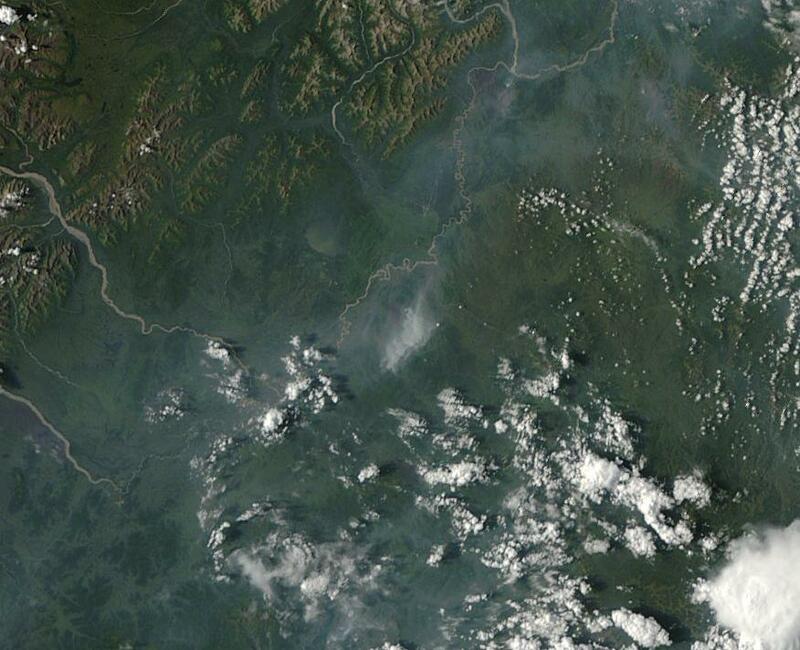 Beneath the smoldering outflow of the Alaskan fires we can plainly see the decayed state of ice. The floes greatly disassociated with widening gaps appearing between diminishing ice clusters. As satellite gives us an overall view of the Arctic from above, local observations can help provide a sense of the sea ice state at the surface. During recent years, cameras mounted on buoys throughout the Arctic have provided us with a first-hand account of the story of Northern Hemisphere sea ice decline. And during recent days almost every camera-based buoy has shown an extensive expansion of melt ponds and open water. 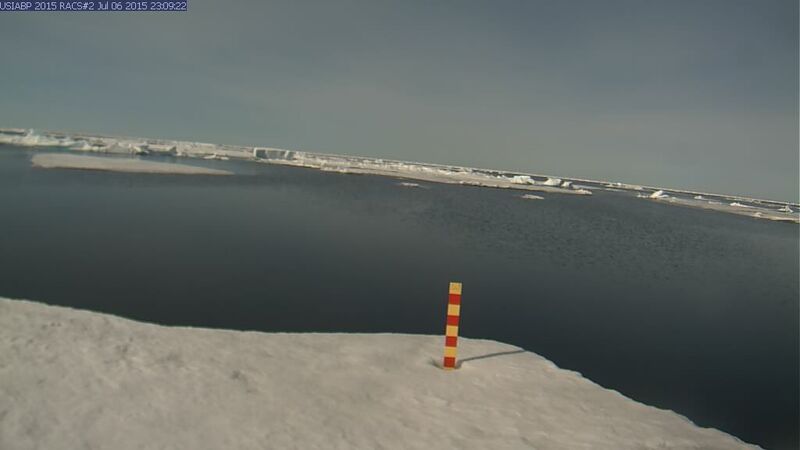 (Extensive melt ponding extends as far north as the Pole). In the swiftly thinning ice pack of the Beaufort even the contrast of a single day can be quite stark. In the above top-bottom comparison of RACS#2 ice buoy photos we find that wide but placid areas of sunlit open water in the Beaufort Sea on July 6th (top frame) have rapidly transformed to wind-driven 1-2 foot waves whipped up by 15-25 mile per hour winds on July 7th (bottom frame) in association with a tightening gradient around the strengthening high pressure in the Central Arctic. Waves of this kind can deliver a significant amount of melt forcing to the ice — mixing cooler surface waters with warmer waters below as well as rocking through the ice floes with a rain of incessant, ice-breaking blows. Increasing model agreement indicating rapid sea ice melt, observations of sea ice weakness via satellite and buoy based systems throughout the Arctic, and predictions of a substantial Arctic heatwave all point toward a high and rising risk of rapid sea ice melt. Larger global trends, particularly heat transport from the Equatorial Pacific all the way to the northern Polar zone through the mechanisms of El Nino, human based greenhouse gas heat forcing, and the associated Ridiculously Resilient Ridge, heighten this risk even further. Finally, a wide array of observations indicate that such rapid melt is already starting to set in. Given this increasing agreement and confluence, it appears that the late June ice dispersal is likely over and that serious trouble for Arctic sea ice has now set in and will remain in play for at least the next seven days. These days — in the age of the fossil-fueled hothouse — it’s never good news when a high pressure system forms over Greenland during Summer. Human dumping of carbon into the atmosphere has forced warming over the last remaining great Northern Hemisphere ice sheet at a rate of about 0.5 degrees Celsius each decade. 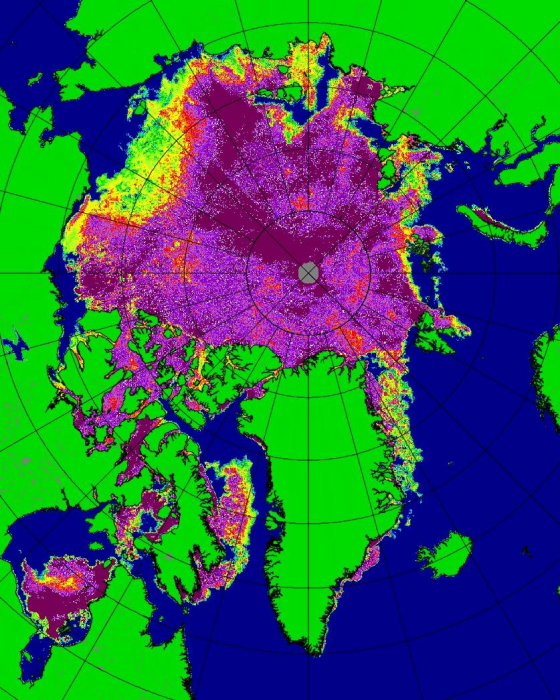 A constant rain of soot from human industry and from increasingly prevalent and intense Arctic wildfires has painted the ice sheet dark, lowering its ability to reflect 24 hours of incoming radiation from the Summer sun. And the result is that each Summer, when the skies clear and high pressure systems form over the ailing Greenland ice, you end up getting these huge surface melt spikes. Generally a big melt spike can be defined as anything greater than 35 percent of Greenland ice surface area. And we’ve had quite a few of these abnormal events in recent years. The worst of which happened in mid Summer of 2012. During late June and early July of that year, an extreme high amplitude Jet Stream wave generated very warm surface temperatures over the Greenland Ice Sheet. A very warm fog settled over the ice, eating away at it. By July 8th, more than 90 percent of the surface was melting — an event that hasn’t happened in Greenland for more than 100 years. 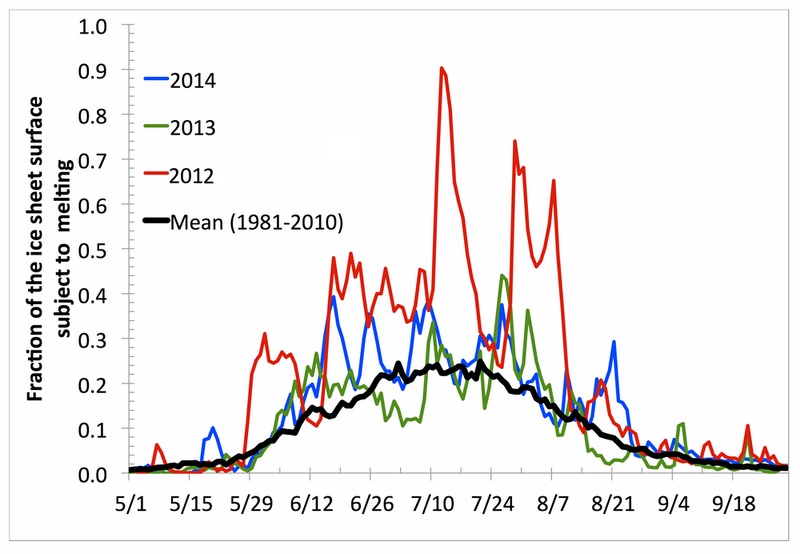 June, July and August of 2013 and 2014 saw similar, though somewhat less intense, Greenland melt spikes. During those years the ice sheet experienced multiple days in which melt covered between 35 and 45 percent of its surface. And though these instances were not as intense as the unprecedented 2012 melting, they did traverse well beyond the 1981 to 2010 average line (an average that itself includes a rapid warming trend) to, in cases, exceed the upper 2 standard deviation margin. 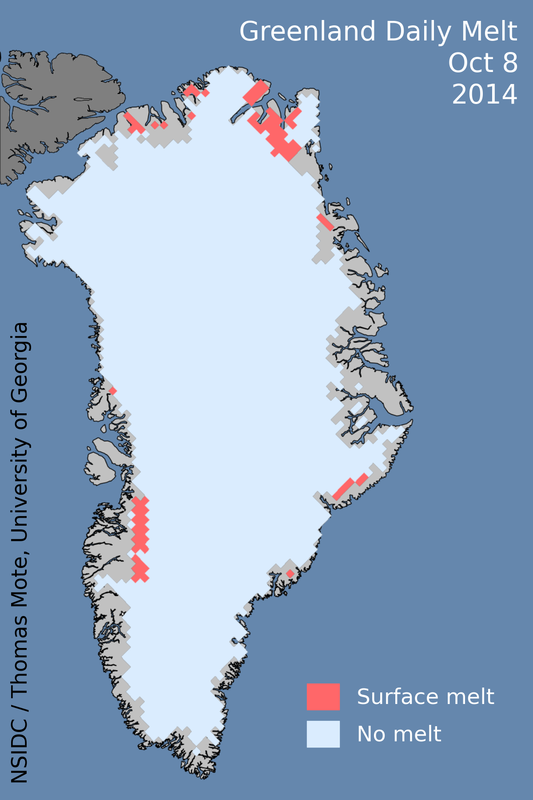 After record 2012 melt, surface melt for Greenland has remained abnormally high — indicating an increased likelihood that more near 100 percent surface melt summer days may not be too far off in the future. 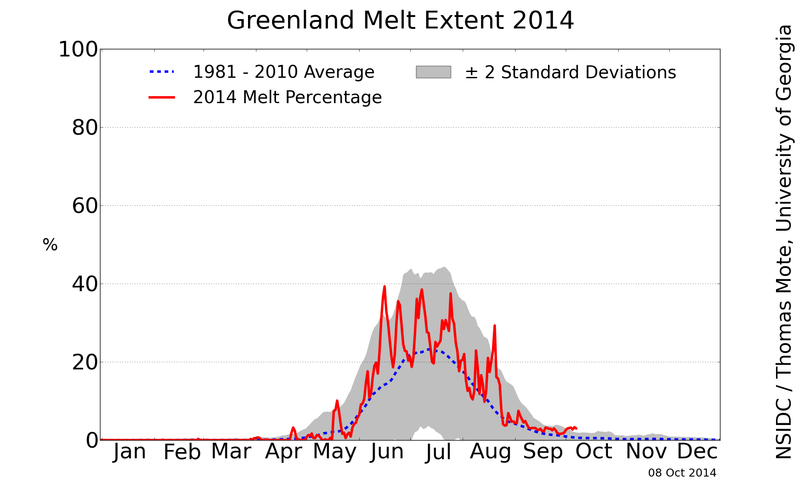 The post 2012 environment for Greenland has thus been a period of continued and heightened surface melt. One that appears to be in the process of building up to another big pulse. 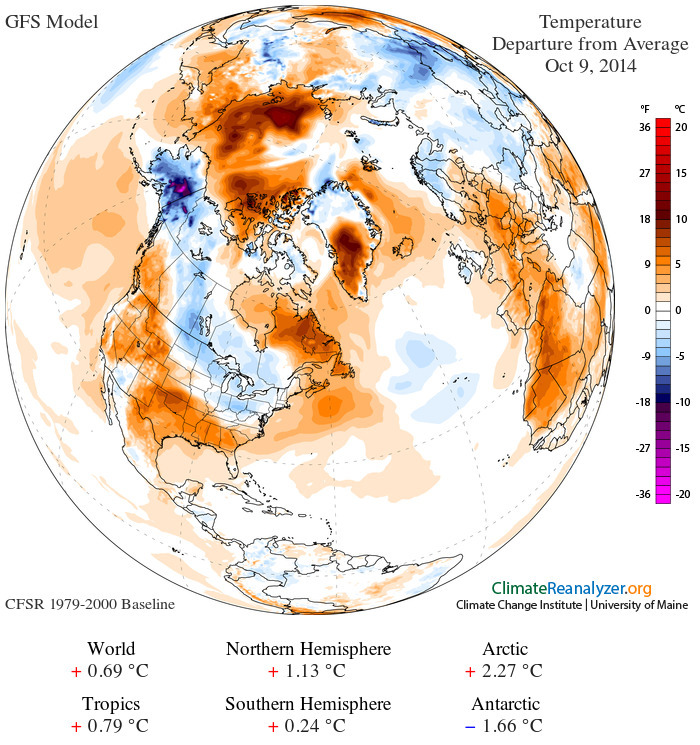 The summer of 2015 marks a continuation and intensification of this ominous surface melt trend. After getting off to about an average melt start during April and May, June saw surface warmth build over the Greenland Ice Sheet with melt extents jumping to between 30 and 40 percent of surface area by mid-to-late month. Further warming coincided with massive Alaskan and Canadian wildfires injecting soot plumes into regional airspace and the building of a substantial high pressure ridge over Greenland. These factors helped enable further atmospheric and ice warming — shoving surface melt above the 50 percent line by July 4th. This puts 2015 Greenland surface melt in a range well above 2013 and 2014, with the first week of July already exceeding 2012 melt for that period. Over the next seven days, models predict a larger warming of the overall Arctic environment even as a high pressure system and associated ridge remains entrenched across Greenland. This predicted weather pattern will tend to lock in significantly warmer than 20th Century average temperatures. That said, forecast highs do not yet indicate a substantial risk for a repeat of 2012’s near 100 percent surface melt. However, projected high temperatures do show some potential that melt percentages are likely to continue to range between 40 and 60 percent surface melt over coming days with the highest risk for melt spikes occurring on July 6th, 7th and 8th. It is worth noting that we are now in the midst of a substantial Greenland melt spike, one that we’ll continue to monitor over coming days for further developments. A lot of attention has been paid to a ‘Blob’ of unusual warmth at the ocean surface in the Northeastern Pacific. And for good reason, for that Blob of human-warmed water has had wide-ranging negative impacts on both weather and sea life. 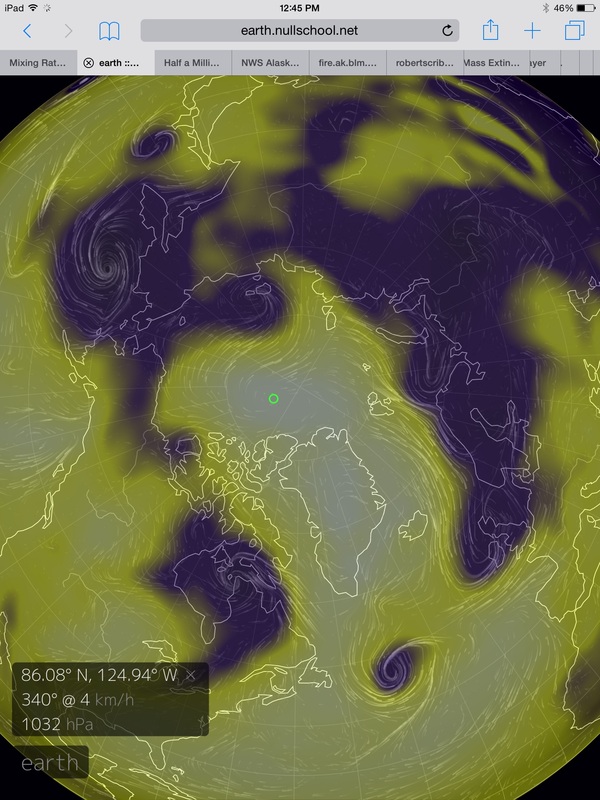 Now there’s a second hot Blob forming in the Bering and Chukchi seas. One that may also have some rather significant effects as the summer of 2015 continues. Hot Blob #2 is a vast stretch of warm water covering the Bering and Chukchi seas between Alaska and Kamchatka (Neven, in his most recent sea ice summary, touched on this building warm water zone here). It encompasses surface waters in an usually frigid region that now feature temperatures ranging from 3 to 5.5 degrees Celsius above normal. 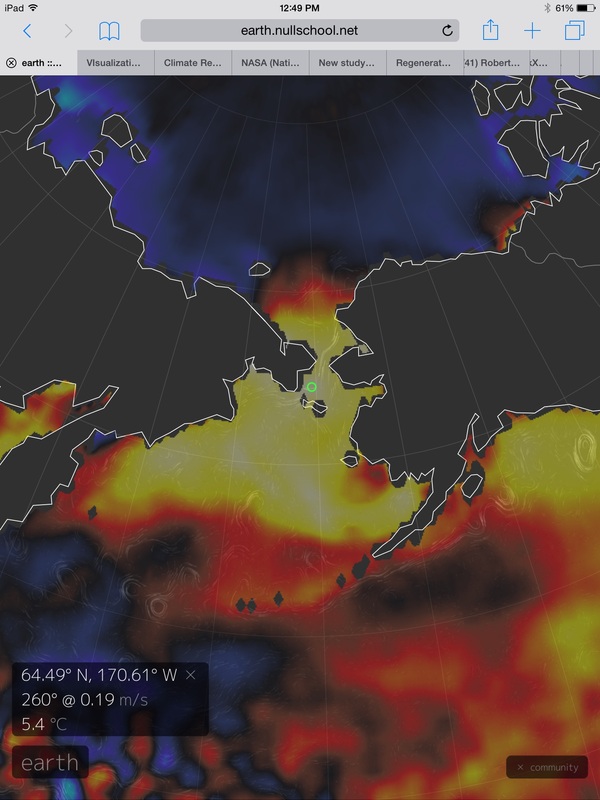 Covering an area roughly 800 miles in diameter, this pool of outlandishly warm ocean waters is being fed by currents running up from the south and by heat bleeding off Alaskan and Siberian land masses. In this case, land masses that are also experiencing record heat. Though the abnormal warmth is also likely fed by a powerful albedo switch from white, reflective sea ice, to dark, sunlight absorbing ocean, other factors associated with El Nino and related to the hot blob off the North American West Coast are also likely in play. And of particular interest in this present extreme hot water situation are currents flowing northward out of these warm pools and directly into the Arctic. Currents that have been eating away at the ice since winter. One warm water bearing current — the Alaskan Coastal Current — runs directly out of the abnormally hot surface zone in the Northeastern Pacific (Blob #1). This current flows along the North American Continental Shelf, out past the Aleutian Island Chain and finally up into the Bering Sea. 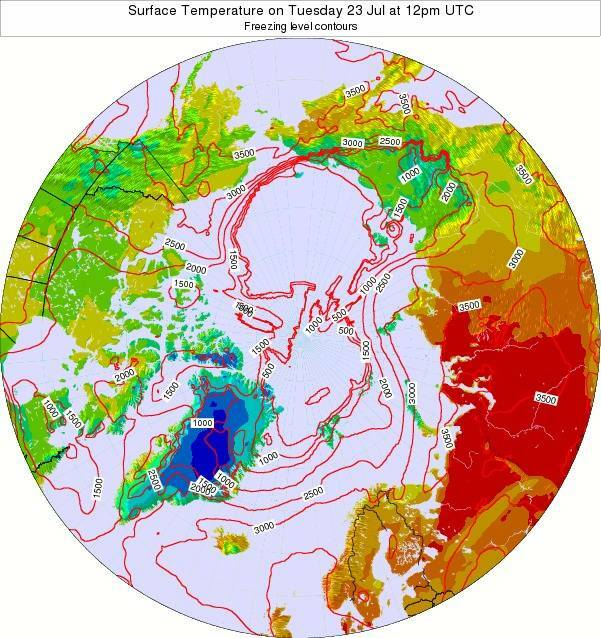 A second current — the Siberian Coastal Current — feeds into the Bering from the Asian Continental Shelf. These currents then combine and push Bering Sea waters on through the Bering Strait and up into the Chukchi Sea. Northward propagation of these currents during spring and summer plays a critical role in the rate of sea ice recession in the Bering, Chukchi, Beaufort and East Siberian Seas. Waters warmed by the summer sun and by the more rapidly heating continents amplify in the Bering Strait before making contact with the sea ice and pushing it to melt and recede. This year, waters in the Strait are extraordinarily warm — measuring 5.4 degrees above normal surface water temperatures. A plug of 5 C + above average water entering the Chukchi, Bering, Beaufort and East Siberian seas at a time when solar insolation is hitting peak intensity and during a period when nearby Arctic regions like Alaska are experiencing some of their hottest temperatures ever recorded. These waters, at temperatures in the range of 7-8 degrees Celsius, are warm enough to rapidly melt any ice they contact. And they’re flooding directly toward the ice pack. Unusually warm surface water and air temperature impacts can already be seen further down the coast in places like Barrow, Alaska. Today, near shore sea ice dramatically melted and off-shore sea ice has retreated poleward — revealing the tell-tale blue of open ocean in the distance. An extreme one day change for Barrow sea ice, which only featured melt ponds and some near-shore melt 24 hours before. Looking northward, we find ice pack conditions showing substantial thinning, significant melt pond formation over the surface ice and increasingly disassociated ice flows in the Beaufort, Chukchi, and East Siberian Seas. Near shore ice in the East Siberian Sea (ESS) has taken on a vivid blue or glassy appearance indicative of melt pond formation. Melt and compaction wedges have formed in the ESS along an axis pointing toward the pole. In the Chukchi, sea ice recession and thinning appear to be proceeding quite rapidly, while dispersing ice in the Beaufort is hitting warmer surface waters, fed by Mackenzie River outflow, and melting. The Navy’s ARCc historic and forecast model run for May 30 through June 30 shows rapid thinning of sea ice in the affected regions. The forecast run for the next seven days shows extreme thinning continuing through the ESS and Chukchi, with thicker ice in the Beaufort also experiencing substantial reductions (Note that the Navy’s GLBb model runs look even worse). Overall, given the fact that storms are now ranging through substantial sections of the Arctic, pushing for more sea ice dispersal, losses will tend to show up more in the sea ice area and volume measures first. Dispersal will also tend to mute extent losses for a time. Given the delay in area and volume tracking, it’s likely that overall impacts to sea ice will tend to be muted in the measures over coming days with a clearer signal showing up by late June and early July. But despite these underlying and complicating weather conditions, the fact remains that a lot of unusually warm water is heading northward toward the ice, with likely greater impacts to follow. 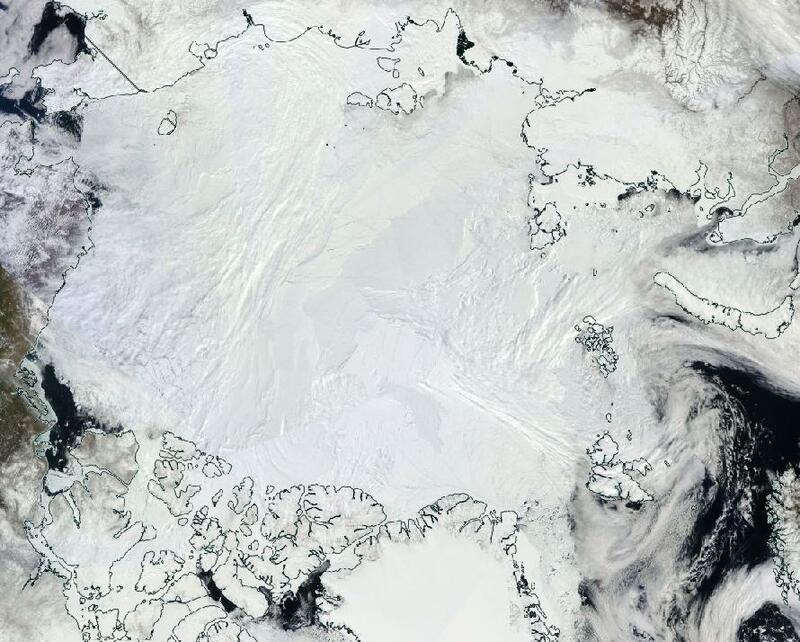 Arctic Sea Ice Conditions Worsen, Nightmare Melt Scenario in the Works? It’s the end of a bad week in a bad month in a bad season in the all-too-bad, human-heated, era for Arctic sea ice. As of the middle of this week, both the US measure — NSIDC — and Japan’s measure — JAXA — were showing record low daily sea ice extents. The lowest levels in the history of Arctic sea ice observation for this time of year and likely the lowest levels for hundreds, even thousands of years. As charts go, the JAXA graphic looks pretty amazingly ominous. A 2015 sea ice extent line diving below all others, steadily plumbing an abyss that, if not this year or the next, could lead to a dreaded blue ocean event in the not-too-distant future. The kind of upshot from human greenhouse gas emissions we thought we might see by 2080 or later. One that has become increasingly more likely during recent years and that some researchers are expecting could emerge by before 2020. Above you can seen the 2015 red line taking its most recent plunge after hovering very near to record low levels. According to JAXA’s Polar Research Center, sea ice extent dropped like a stone to 11.44 million square kilometers yesterday, or about 200,000 square kilometers lower than the previous record low value set in 2006. The problem is not just one of a new record low. It’s one of timing and divergence. Accelerated melt in the May-to-June time-frame can have serious impacts on late season ice. The reason is that greatly reduced ice coverage also reduces albedo or reflectivity. The result can be compounded warming and increased heat absorption by darker surfaces under the 24 hour Arctic sunlight of June and July. Large open stretches of ocean also enable swell formation, which can chew away the ice. And already we can see very large sections of dark, low albedo, ocean forming throughout many vulnerable regions. For this time of year, we have very advanced sea ice loss and open ocean development in the regions of the Chukchi, the Beaufort, Northern Baffin Bay and the Kara. In addition, large open water areas are now becoming visible in the Laptev. A far northern extent of sea ice melt for May in addition to typical seasonal losses coming from Hudson Bay and southern Baffin Bay. Such record low ice totals at this time of year can enable far greater melt advance by end season if the weather stacks up in all the wrong ways. And, at least for the next week, the weather forecast is tilting ever more heavily toward a melt-enhancing extreme warming of Arctic regions. Over the next seven days, heat is predicted to continue to flood from south to north — goaded along by high amplitude ridges in the Jet Stream continuing to form over Northwestern North America and the Siberian region adjacent to the Kara Sea. The warm flux zones are forecast to deliver unseasonable, above average temperatures to the Arctic — resulting a general state of much warmer than normal conditions for the entire Arctic Ocean by late next week. As a result, we see temperature anomalies for the entire Arctic Ocean zone hitting a range of between 5 and 15 degrees Celsius above average for next Friday (May 29, 2015). Such a warm air surge would push temperatures in the above freezing range for almost the entire Arctic Ocean area. These are temperatures more typical of late June and early July. Conditions that, should they emerge, would result in a multiplication of ice-threatening melt ponds, a further expansion and warming of already unseasonably large open water zones, and a forcing of more ice-eating, high heat content water vapor into the Arctic environment. Any forecast is subject to uncertainty. Rapid May melt during 2013 and 2014 stalled out during June of those years. However, May melt is significantly more advanced this year than during those years. And, as opposed to 2013 and 2014, GFS model forecasts showing warmer than normal conditions have tended to be correct. 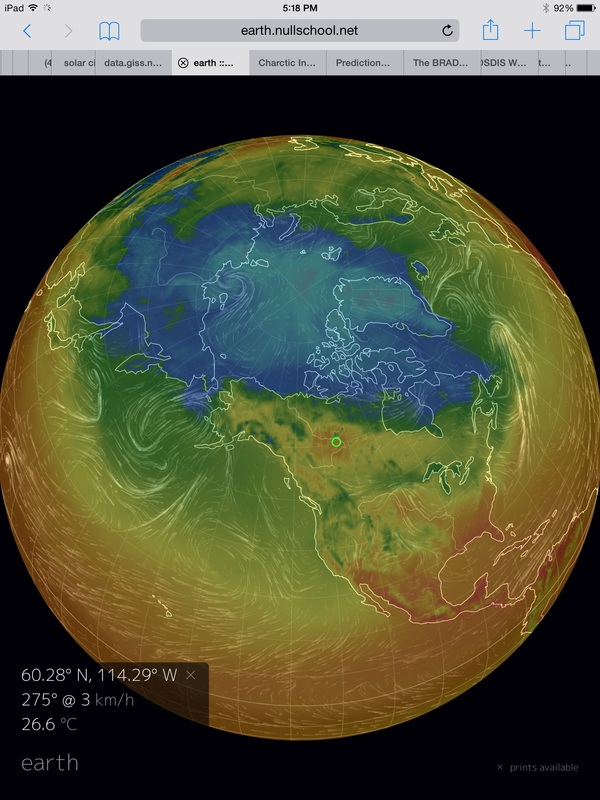 The warm air slots over Northwest North American and Western Siberia are also very well established at this time. As a result, there’s high risk that the current record lows now appearing in the NSIDC and JAXA measures with continue to deepen over the coming week. 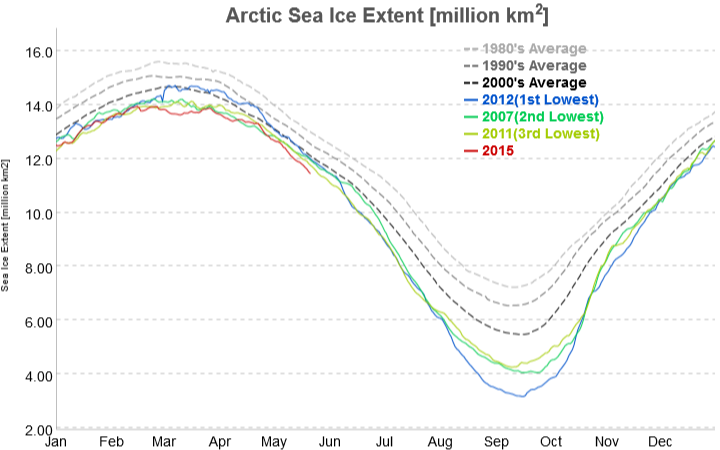 It’s an utterly wretched situation for sea ice in the Northern Hemisphere. One that will bear very close watching as the risks now appear to be heading toward some unsettling markers. Temperatures there yesterday afternoon read 80 degrees Fahrenheit. Where I sat typing this blog in Gaithersburg, Maryland, it was a somewhat cooler 67. A north-south temperature flip-flop that has become all-too-common in recent years. A warming in the Arctic that sets the stage for gargantuan summer wildfires burning through some of the world’s greatest carbon stores. Vast and thawing permafrost deposits stretching in a great arc from Siberia through Alaska and on into Northern Canada. Immense loads of fuel for a newly forming ring of fire that is now an entirely human invention. Now, fires are starting to flare around this broad stretch of once-frozen lands rapidly warmed by an unprecedented belching of heat-trapping gasses into the Earth’s atmosphere. 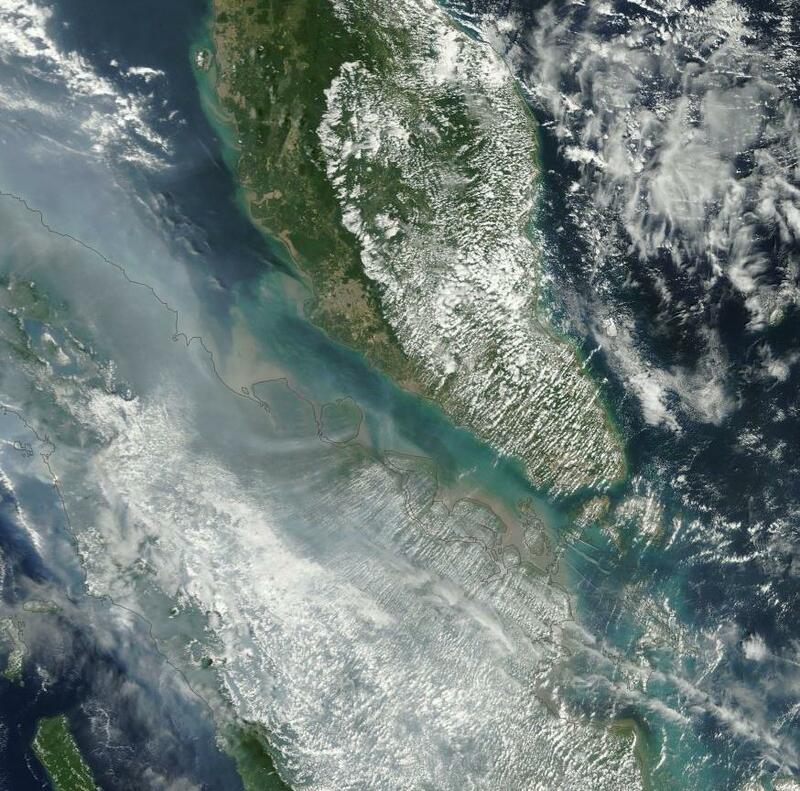 Though the fires are not yet widespread, many are rather large — erupting over a smattering of areas. It is not typical for large fires of this kind to appear at all in May. Nor is it usual to find them in regions girding the Arctic at this time. The first set of blazes ignited during mid April of 2015 through a permafrost zone in the Lake Baikal region of Russia. Though the fires appear to have backed off from the towns and settlements they threatened at that time, they have continued to burn unabated — fading and flaring more than most of the past month. As the more southerly fires continued to burn through thawing permafrost zones, blazes began to erupt further and further north. As of this week, the fires have marched to the shores of Lake Baikal itself, scorching their black scars in the Earth like some great fire giant’s footprints. Leaping over Lake Baikal and moving north and westward we come to the great open spaces of Siberia. Here, in recent years, vast fires have burned through grass, forest and permafrost alike. Few settlements dot the wide expanses. So fire suppression efforts have only rallied when towns and cities were threatened. Meanwhile, the once frozen regions all about have increasingly caught fire. Turning the place into a land of summer flame. By Wednesday, a quartet of significant fires had erupted along a hilly region in Central Siberia. Tuesday, there was but a single blaze. Now four rage across a region that has felt an extraordinary warming not only this year, but for a long succession of years now stretching on for many decades. 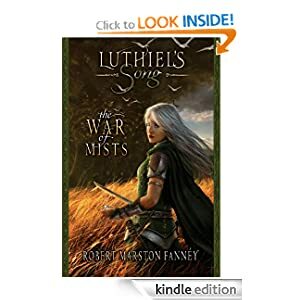 Beyond these newly emerging fires, we begin a pass over the wide open plains of Siberia. There we note a tell-tale whiff of smoke or three. But no large burn points are visible in the moderate resolution satellite shot. Continuing on to just south of Yamal, Russia where the odd methane blow holes first appeared last summer we find a region still mostly frozen. But thaw is predicted to come quickly — coincident with a rapid warm up forecast for the next week. 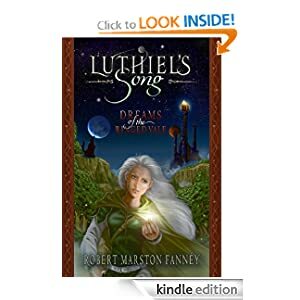 Shifting still westward we cross over Northern Europe, the Atlantic, a thawing Hudson Bay and return to where we started our narrative in Northwest Territory Canada. To near 80 degree Fahrenheit temperatures at Great Slave Lake. 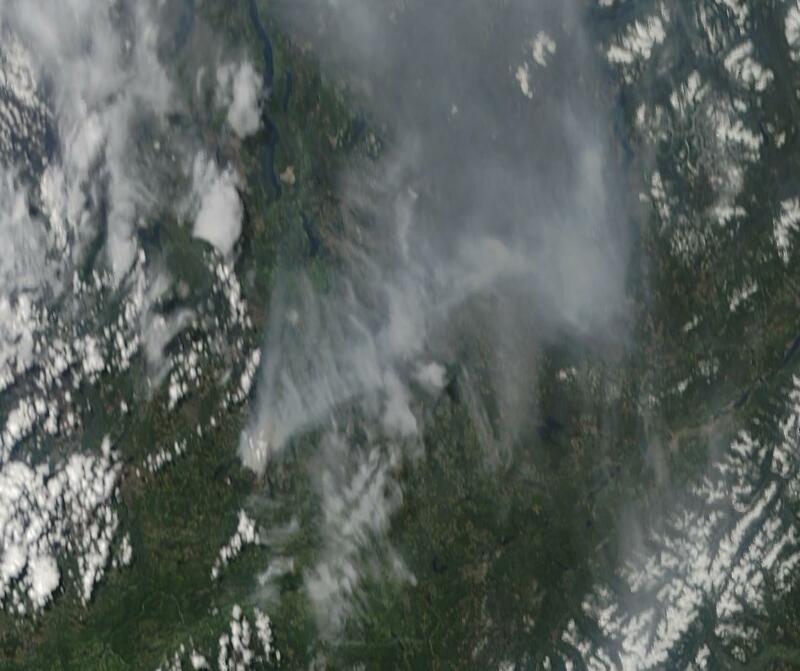 And to a thick cloud of smoke issuing up from the nearby valleys of Northern British Columbia. There, near Prince George, at Norman Lake, a massive wildfire erupted earlier this week. Unable to contain it, more than 100 firefighters and numerous helicopter and heavy equipment crews quickly found themselves fighting a defensive battle against a rapidly expanding blaze. By this morning, the Norman Lake fire had more than quadrupled to 80 square kilometers in size. Indications from the above satellite shot are that the fire is still growing. The massive blaze forced two regional districts to issue evacuation orders or alerts and more than 80 people to evacuate residences. Meanwhile, B.C. has closed its Dahl Lake and Bobtail Mountain provincial parks until further notice. For wide stretches of the Arctic, especially in Central Siberia and Western Canada, winter heat and early spring melt are contributing to a very high risk of wildfires. In addition, the decadal warming forced by human-caused climate change is thawing ever greater portions of permafrost, which also adds near surface fuels to traditional brush and woodlands fires. The early and intense fires we are seeing now represent just the beginning of what is likely to be an extreme fire event for these regions. At this point, we are looking at a worsening fire potential stretching from now through mid September for these vulnerable Arctic zones. For 2015, it looks as if Arctic sea ice is sitting in some rather hot water. For from the Chukchi to the Beaufort to Hudson Bay to Baffin Bay and on into the Kara, the edge region of the Arctic Ocean is feeling a very strong melt pressure during early May of 2015. And, according to 7-10 day forecasts, that melt pressure will only intensify. As a result, we could see new record lows for Arctic sea ice extent over the next few days. 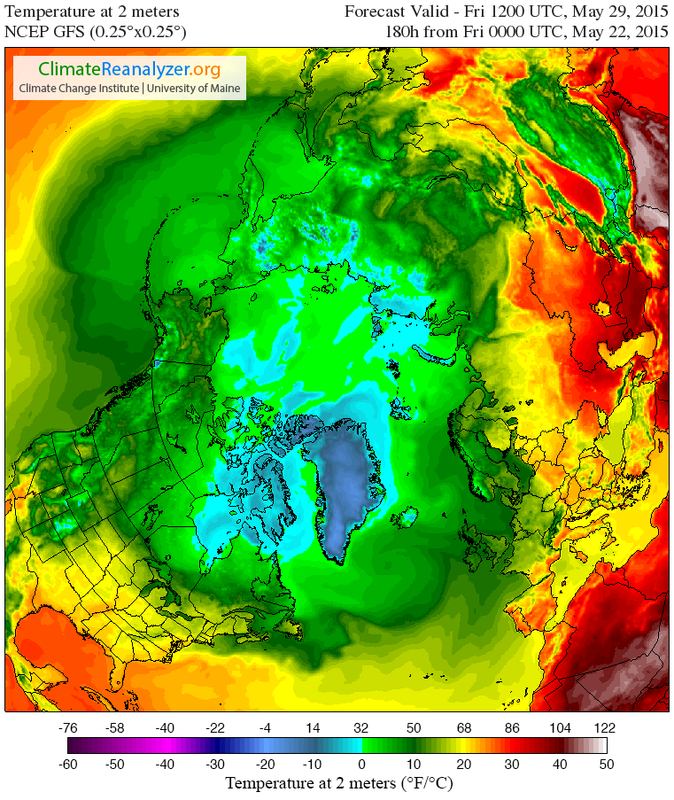 Arctic warming is now particularly intense along a broad region running from coastal Alaska through to the Mackenzie Delta and on into the northwestern portion of the Canadian Archipelago. It’s an area that typically waits until at least June to melt. But, this year, sea ice recession, break-up and opening of large polynyas for this far northern area is occurring almost in tandem with melt in more southerly regions like Hudson Bay. For both the Chukchi and Beaufort Seas are continuing an early melt that began in March and has proceeded on to this day. 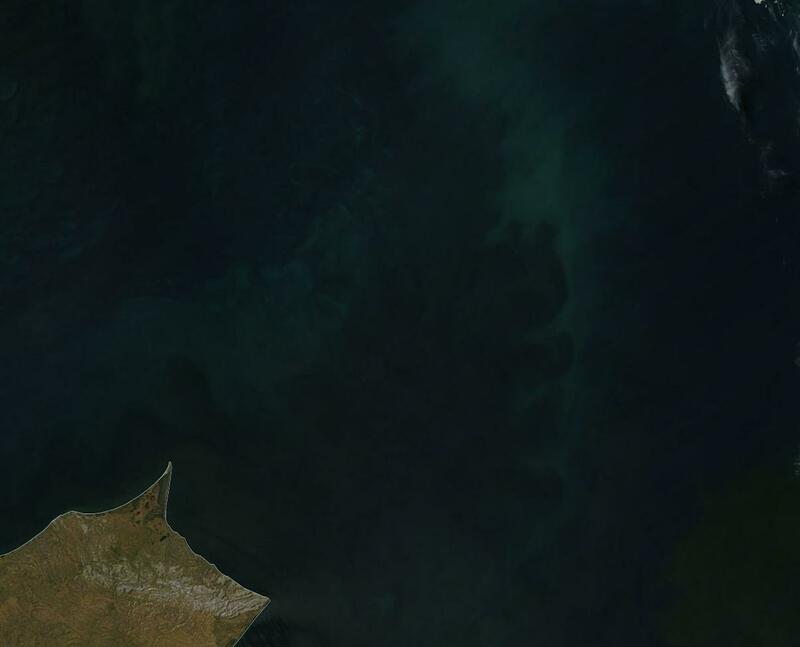 In the image above we can see the MODIS satellite shot for the Chukchi Sea region on May 11, 2015. Note both the fractured nature of sea ice, the ice edge retreat that has already progressed well past the Bering Strait (a retreat far beyond a steadily retreating average extent line), and the very large polynya advancing into the Chukchi along the northern edge of Alaska. It’s a melt that has been spurred by powerful southerly air flows and wind-driven currents issuing from the Bering Sea and Pacific Ocean to the south. There, a cluster of storms continued to back up and deflect northward toward the Arctic as powerful high pressure ridges remained entrenched over a pool of record warm water in the Northwestern Pacific. These same ridges are driving warm air up over the western region of the North American Continent. This flood of warm air has persistently invaded the Northwest Territory of Canada, forcing an early melt of the Mackenzie River. The heat has also frequently invaded the southern Beaufort Sea. 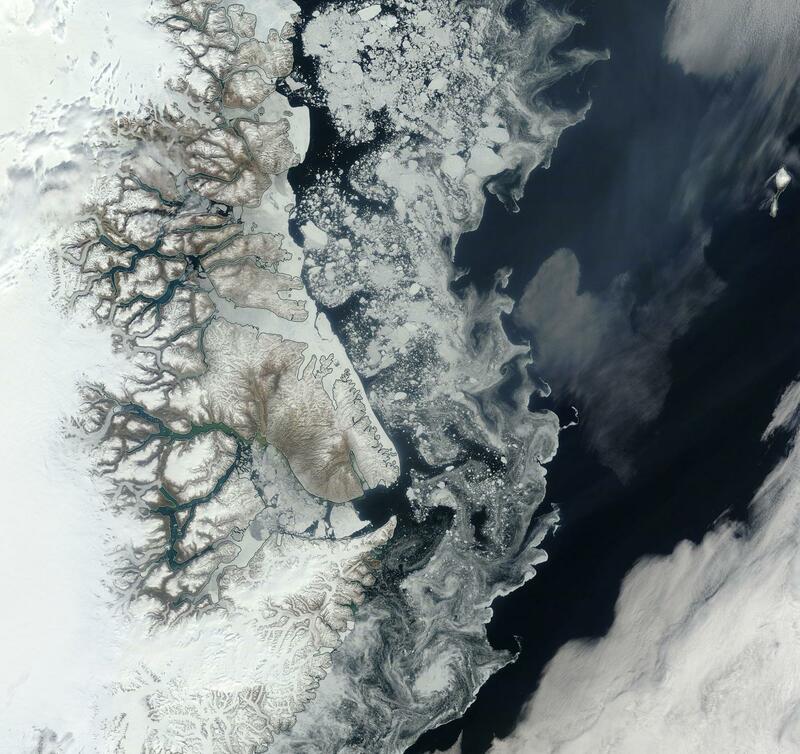 The result is that the sea ice there is greatly fractured and that a large polynya dominates a wide area bordering Alaska, the Mackenzie Delta, and the Canadian Archipelago. This polynya extends about 650 miles, has a width ranging from 15 to 80 miles and stretches 250 miles into the Canadian Archipelago between the Northwest Territory mainland and Banks and Victoria Islands. Many hundreds of miles to the north and east of this large polynya, is a mess of fractured ice rippling out through the Beaufort Sea. A massive disassociated ice flow that belies great general weakness for sea ice in the region. 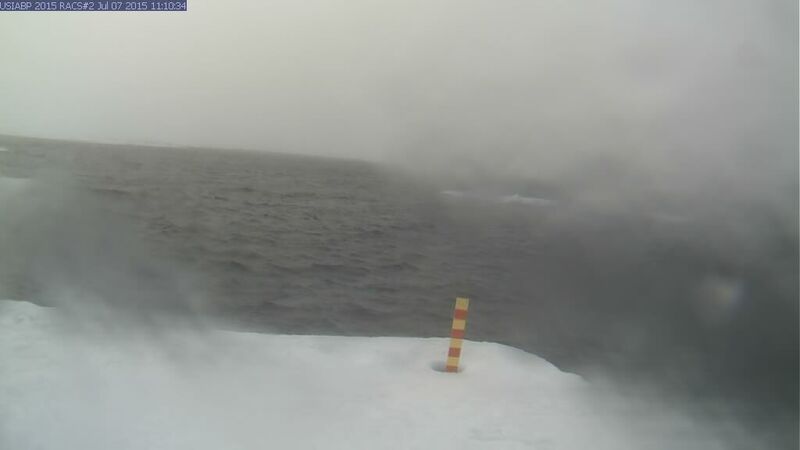 As melt season progresses, these wide, dark areas of open ocean will serve to trap the radiant heat of 24 hour sunlight. The expansive stretches will generate swells that tear away at the surrounding ice. Already fractured ice flows will retain far less integrity than the contiguous, and far thicker, ice of years past. These combined factors set up conditions that can greatly enhance and speed the rate of ice loss as the spring advances into summer. This risk is particularly relevant when we consider that sea ice extent measures were at record low values throughout about half of March and for brief periods during early April. Currently, sea ice extent is at its second lowest level on record. A value that is now rapidly plunging toward the record low line set in 2006. Any continuation of the current rate of decline would bring the extent measure into new record low territory over the next few days. A weekly continuation of this trend could push extent values far into record low territory, further worsening sea ice prospects for the broader 2015 melt season. To this point, 7 day forecasts predict a massive warm-up building over Alaska and the Northwest Territory through May 19th. Temperatures over land in this area are expected to build into the 70s and low 80s. This extreme warmth, in the range of 10-20 Celsius above average (18 to 36 Fahrenheit), will stretch all the way to Arctic Ocean shores off the back of a ridiculously resilient ridge in the Jet Stream. A ridge that has persisted, off and on, for much of the past three years. Above freezing temps will pulse out from the ridge to cover most of the Chukchi and almost all of the Beaufort — adding melt pressure to already fragile sea ice conditions for that region. It’s Fall in the Arctic. Temperatures are dropping. Sea ice is expanding. Snow and frigid weather slowly advance through these extreme northern lands. But the pace of cooling this year — as in recent years — is far slower than what we would have typically seen just a few decades ago. 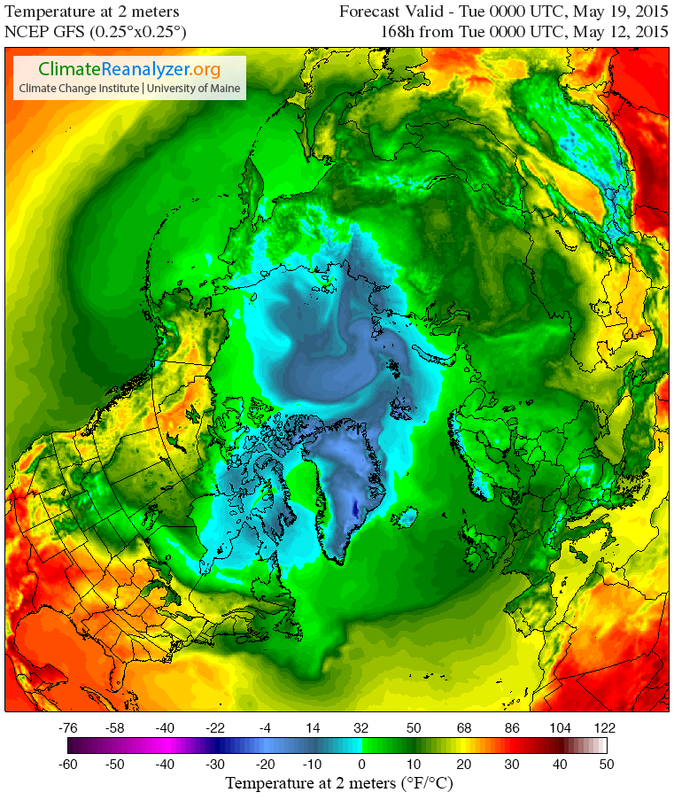 For in a crescent encircling the North Pole from the Laptev Sea through the Beaufort through the Canadian Archipelago and on into Greenland, temperatures are ranging between 5 and 12 degrees Celsius above average (9-20 degrees F). This extra atmospheric heat has tipped the entire Arctic into a +2.3 positive temperature anomaly — a rather high range for so early in the season. A strong polar amplification evident well in advance of a winter which is likely to see total positive anomalies reach between 3-6 C for the entire Arctic. The oceans are bleeding record or near record heat into the Arctic atmosphere. The thinned sea ice, in the range of 6th lowest on record, allows more of that heat to hit the air. High amplitude waves in the Jet Stream deliver more heat than ever before from the lower latitudes. An a heavy overburden of greenhouse gasses — at even higher concentrations than in the rest of the world — traps more and more long wave radiation trying to escape into space as the sun’s angle lowers and the long winter night approaches. For many regions of the Arctic, what this means is more Summer-like conditions continuing on into Fall. For Greenland, this has meant levels of melt that are more than two standard deviations outside the norm for the month of October. Over Southern Greenland, we’ve seen temperatures in the range of 10 to -14 C from the coastline to the top of the ice sheet. And over Northeastern Greenland, we still see temperatures approaching freezing — an up shot of the warm air and water pool in the ocean zone between Greenland and Svalbard. As a result of this lingering warmth, NSIDC measures are showing melt through substantial zones — one around the western coastal region near the Jackobshavn Glacier and another in Northeast Greenland in the Zachariae Glacier outflow region. Pushing melt totals more into the range of what is typical for either late May or early September. Throughout the next couple of days, unseasonal warmth is expected to build back into Southern Greenland and to possibly take root in the northwestern coastal region. With 5-18 C above average temps expected for many areas, it is likely that the abnormal Greenland melt will continue for at least the next couple of days. As noted above, conditions remain in place for the Arctic to continue to experience highly abnormal warmth as Fall continues its advance into winter — with warmer than normal temperature departures likely to peak coincident with the deepest periods of Arctic darkness. Add salt, sand, and thawing methane pockets buried beneath scores of feet of warming permafrost together and what do you get? Massive explosions that rip 200-300 foot deep and 13-98 foot wide holes in the Siberian earth. 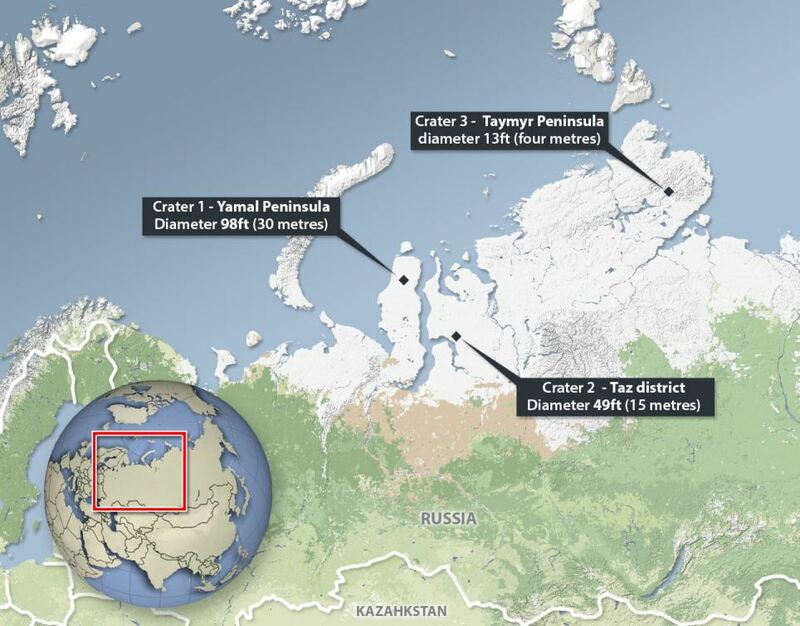 The name for the place where this strange event first happened, in Russian, is Yamal, which roughly translates to mean ‘the end of the Earth.’ Now, three holes of similar structure have appeared over a 700 mile wide expanse of Siberian tundra. The most likely culprit? Catastrophic destabilization of Arctic methane stores due to human-caused warming. About 10,000 years ago, as the great glaciers of the last ice age gave up their waters in immense surges and outbursts into the world ocean, a broad section of Siberian tundra was temporarily submerged by rising seas. But with the loss of the great glaciers, pressures upon the crust in these zones subsided and, slowly, the newly flooded tundra rose, again liberating itself, over thousands of years of uplift, from the waters. The land remained frozen throughout this time, covered in a layer of ice — solid permafrost hundreds of feet deep. But the oceanic flood left its mark. Salt water and sand found its way into cracks in the icy soil, depositing in pockets throughout the frozen region’s earth. And there this chemical brew remained, waiting to be deep-frozen and sequestered as the glaciers of a new age of ice advanced over the Earth. But this event, foretold and anticipated in the bones of Earth, did not come to pass. Instead, human beings began dumping billions of tons of heat-trapping carbon into the atmosphere. They dug up mountains of ancient carbon and burned it. And now those mountains of carbon lived in the air, thickening it, trapping heat. For Siberia, this meant rising temperatures. At first, the increase was slow. Perhaps a tenth of a degree per decade. But by the time the 20th Century was closing and the 21st Century emerged, the pace of warming was greater than at any time even the Earth could remember — an increase of 0.5 degrees Celsius or more every ten years. Now, the glaciers will probably not return for hundreds of thousands of years, if ever. And now, the brew that was waiting to be buried is instead thawing and mixing. A deep, heat-based cracking of the frozen soil that flash-bakes an alchemical mixture deposited over the ages. The result: dragon’s breath erupting from the very soil. The earth was first observed to smoke. This continued for some time and then a bright flash followed by a loud bang exploded above the tundra. After the mists and smoke cleared, a large hole surrounded by mounds of ejected soil was visible. The hole tunneled like a cone more than 200 feet down. Its walls were frozen permafrost. A single event of this kind might be easy to overlook as an aberration. A freak case that might well be attributed to unique conditions. But over the past two weeks not one, not two, but three large holes, all retaining the same features, have appeared within the same region of Yamal, Russia. A single event may well be easily marked off as a strange occurrence, but three look more like the start of a trend. The holes may foreshadow bigger problems for our planet in the near future, scientists worry. Permafrost around the Arctic contains methane and carbon dioxide, and both could be dangerous to our environment if released, according to a report from the National Snow and Ice Data Center. As long as the permafrost remains frozen, the report adds, this isn’t a concern, but climate models have painted a grim future for rising temperatures in the Arctic. And with temperatures in the Arctic, and especially over Siberia, rising so fast, the permafrost is not remaining frozen. It is instead thawing. And together with this thaw comes a growing release of carbon stored there over the 2-3 million year period since the ice ages began their long reign. It is a release we can expect to continue together with human-caused warming. One that is critical to abate as much as possible, if we are to have much hope for a climate favorable for human beings and the continuing diversity of life on this world. How rapidly and violently the Arctic responds to our insults depends on how hard we push it. And right now, through an amazing human carbon emission, we are now pushing the Arctic very hard. If the warming trends continue and fossil fuel burning does not abate, these holes may be only minor explosive outbursts compared to what may follow. 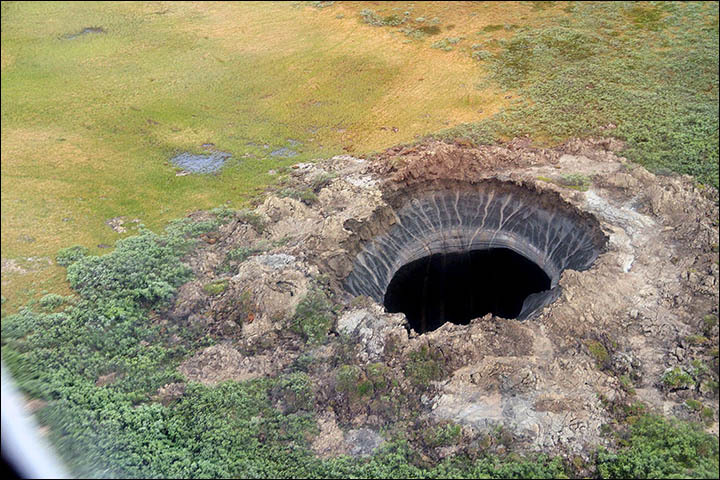 In any case, given current trends, it appears entirely possible that more and more of these strange holes will be appearing throughout the Arctic. An ugly sign of the danger inherent to our time. Is this the Compost Bomb’s Smoking Gun? Svalbard. Until lately, a little-known locale situated between the previously frigid extreme North Atlantic and the Arctic Ocean about 500 miles east of Greenland. 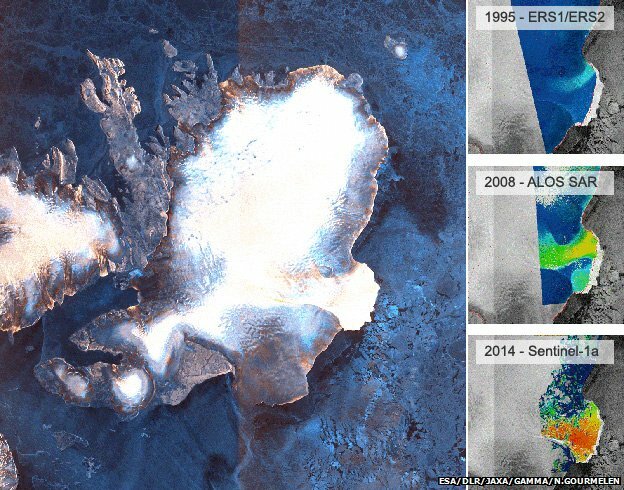 Typically a frozen island Archipelago, this pristine and sparsely inhabited redoubt has, over the past few years been ground zero for the assaults of an ongoing and extreme polar heat amplification. During winters, temperatures in Svalbard are generally, well, Arctic. But in recent years abnormal winter warmth featuring temperatures ten, twenty, even thirty degrees above 20th century averages have been experienced with increasing frequency. This year, during one of the warmest winters on record for the Arctic, local Svalbard temperatures rocketed to as much as 40 degrees F above the usual range and for extended periods remained in the range of +20 to +30 F positive anomaly. For all of February of 2014, the average temperature for this Arctic island chain was -1 C (about 30 F), a full 15 degrees C above average and a period that featured many readings at or above freezing. It was an unprecedented event for an island that features one of the largest ice caps on Earth. Austfonna sprawls across the northeast section of Nordaustlandet, one of Svalbard’s many islands. The ice cap covers fully 8,000 square miles and features an ice dome pinnacle looming 750 meters high making it the largest of its ilk. Though not as grand as the great ice sheets of Greenland or West Antarctica, Austfonna still contains an immense amount of water. Less stable than ice sheets, deteriorating ice caps currently contribute to almost 50% of global sea level rise. But Austfonna, the largest of these, was thought to be somewhat insulated from the insults plaguing most of the world’s ice caps. Its far northern and previously frigid location at Svalbard made it less vulnerable. But that was before sea ice loss opened the gates to an ongoing and ever-increasing assault of warm winds. Now, according to findings made by the European Space Agency’s (ESA) Sentinel 1 Spacecraft, it appears that the ongoing assault of heat has at last destabilized the great Austfonna. For according to radar altimetry readings, the pace of the ice cap’s motion toward the Barents Sea has, over the past three years, accelerated to an extraordinary speed ten times more rapid than its previous pace (Sentinel’s findings are due to be published soon in a prominent scientific journal). Austfonna is just the most recent of many very large ice caps, ice sheets, or glaciers now showing increasing rates of motion toward the world ocean. In many cases, once destabilized, these great bodies of frozen water have reached a point of no return as they lunge toward an inevitable destiny of melt, outflow, and disintegration. The most recent and ongoing rash of destabilizations are likely to have significant implications for global sea level rise due to human caused warming going forward. And with human heat forcing and amplifying Earth System feedbacks still on the rise, the glacial butcher tally isn’t likely to end any time soon. Major melt in the midst of winter. Doesn’t sound quite right, does it? We tend to think of winter as the time of freezing, as the time of ice accumulation. Not the time of melt and thaw. Now try this — major melt in Alaska in the midst of winter. Average temperatures 40 degrees hotter than normal in the midst of winter. Rainfall over snow and ice causing avalanches, major road blockages and ice dams to rivers in the midst of winter. In this instance we have been transported from the somewhat odd into a reality that is completely outside of our previously ‘normal’ context. In this instance we are transported to a time that may well seem like the beginning of the end of the age of ice on planet Earth. And yet this is exactly what is happening: one of the coldest regions on the planet is experiencing melt and related record heat in January. For the state of Alaska, the consequences are a strange and freakish winter heat wave, one that features the extreme temperatures mentioned above. For the city of Valdez, as we shall see below, the situation is far more stark. On Sunday, a collapse event that flooded the Arctic with heat and ripped the polar vortex in half began. A freakish high amplitude ridge in the Jet Stream that had been pumping warmth over Alaska and into the Arctic for ten months running strengthened. The result was that many regions throughout the state experienced their hottest temperatures ever recorded for that day, month, or season. According to reports from Weather Underground, Homer Alaska, for example, experienced an all time record high for the day of 55 degrees Fahrenheit, 4 degrees hotter than the previous all-time high set just a few years earlier. And Homer was just one of the many cities sitting in a broad region of extraordinary, 40 degree hotter than normal temperatures. A region extending from the interior to the southern and western coasts. Bolio Lake Range, about 100 miles south of Fairbanks in central Alaska, saw temperatures rocket to 60 degrees, just 2 degrees short of the all-time record high for any part of the state during January (the previous record high of 62 was set in Petersburg, nearly 700 miles to the south and east). Typically colder high mountain regions also experienced record warmth for the day. A zone 10,600 feet above Fairbanks hit 32 degrees Fahrenheit on Sunday, the highest temperature ever measured for this region during any winter-time period from November through February. Even before the most recent extreme Arctic temperature spike, January saw numerous powerful heat influxes for Alaska with Nome, Denali Park, Palmer, Homer, Alyseka, Seward, and Talkeetna each setting all-time record high temperatures during the month. These records come on the back of a long period of rapidly increasing Alaskan heat stretching all the way back to the 1970s. In many cases, we are seeing all-time record highs broken with 5-10 year frequency. In the most extreme cases, these records fall again after only standing for 1-5 years. Taken in this context, what we are seeing is the freakish continuation of an ongoing period of inexorable Arctic warming providing yet one more major insult to the Alaskan climate during the winter of 2013-2014. The same anomalous Jet Stream pattern that has acted as a conveyer belt continuously transporting heat into the high north over Alaska has brought with it an almost endless series of rain events to coastal Alaska. Storm after storm, fueled by heat and high rates of evaporation over the northern Pacific, slammed into the Alaskan coastline, disgorging record levels of precipitation. With temperatures freakishly high, mirroring conditions typically present during late spring or early summer, much of this precipitation fell in the form of rain. Valdez, Alaska, for example, has likely experienced its wettest January ever with rainfall measures just 1.35 inches short of the record on Sunday and a series of strong storms rushing into the city on Monday and Tuesday. Given the nearly endless train of storms lining up to sweep over Valdez, it is possible that its previous record of 15.18 inches for January could easily be surpassed by an inch or two at month-end. 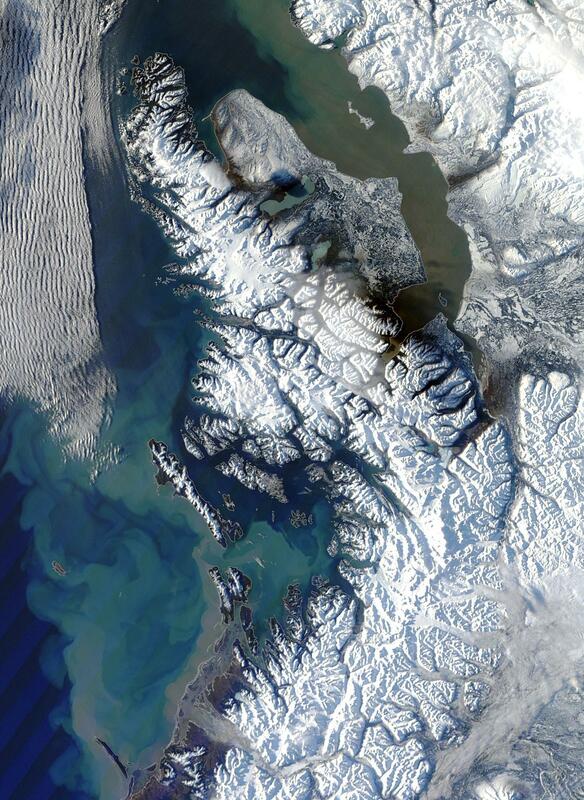 The entire southern coast of Alaska from Prince William Sound to Cook Inlet are visibly experiencing major snow and ice melt along with flooded streams and rivers flushing out a massive volume of sediment into the Gulf Alaska. Clearly visible in the satellite shot, the sediment now streaming into the ocean is more reminiscent of a major late spring flood event than anything that should be ongoing for Alaska in the midst of winter. Yet here we are. A situation of continuous, never-before seen heat for Alaska during winter time bringing on a flooding thaw that is far, far too early. The constant assault of heat and record temperatures combined with an almost endless flow of moisture riding up from the Gulf of Alaska set off a devastating and freakish event near Valdez on Saturday. Severe and record rainfall over the mountain regions have continuously softened glacial ice and snow packs above this major Alaskan city. On Monday, the continuous insults of heat and water passed a critical threshold. As the warm water filtered down through the colder snow and ice, the anchoring base was lubricated even as the capping snow grew heavily burdened with water. 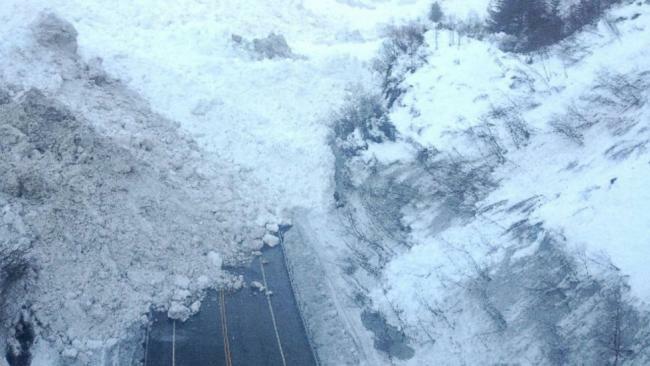 Eventually, the insults of heat and rainfall became too great and a major snow and ice slope system above the main road linking Valdez to mainland Alaska collapsed. The immense volume of snow and ice unleashed, spilling down to fill the base of Keystone Canyon, blocking both the Lowe River and the Richardson Highway running through it. This snow and ice dam rose as high as 100 feet above the Canyon floor, causing the Lowe River to rapidly flood, inundating the already snow-and ice buried road under an expanding pool 20 to 25 feet deep and filled with ice-choked water. Warming-related rainfall events of the kind that has now cut Valdez off from the mainland are just one of the extraordinarily dangerous consequences of human-caused climate change. They are a phenomena linked to the massive glacial outburst flood that killed thousands in India this year together with other dangerous snow and ice melt events. Should such major heating and rainfall events impact Greenland and West Antarctica, the consequences could be even more extreme than what we are currently witnessing in Alaska. In the context of our present extreme Jet Stream pattern that is setting off warmest-ever conditions for Alaska during January together with dangerous melt-outburst related events while at the same time periodically flushing Arctic air and extreme winter weather south into the United States, it is important to remember a few things. The first is that the Arctic is now experiencing never-before observed warmth with stunning frequency. Scientific papers now show that the Arctic is hotter than it has been for at least 44,000 years and possibly 120,000 years. By comparison, the cold snaps, that could very well be seen as the death gasps of the Arctic we know, impacting the eastern US are relatively minor when put into this larger, more ominous context. Similar cold events were last seen about 20 years ago in the US. And so there is simply no comparison that can generate a rational equivalency between the, hottest in an age, Arctic temperatures and the, coldest in a few handfuls of years, temperatures in the Eastern US. And if you’re one of those sensitive, perceptive souls who feels that the weather events you’re seeing, the extreme swings from very hot to somewhat cool temperatures, the extreme swings from drought to record rainfall, and the extreme events now accelerating the melting of the world’s ice and snow, are freakish, strange, and terrifyingly abnormal, then you are absolutely correct. Don’t let anyone, be they friends or family, or journalists in the media, tell you otherwise. There is reason for your discomfort and there is very serious cause for concern. The terrain features in this region include boreal forest and soil that is mostly permafrost. The film shows both burning trees and ground along with a section involved in an episode of explosive outburst. “This wildland fire footage was captured on August 16, 2013, on the southeast perimeter of the Tetlin Junction Ridge Fire (#414), burning east of Tok and Tetlin junctions, north of the Alaska Highway. The blaze that sparked this massive fire tornado is arguably one of the smaller events to impact the Arctic this year, just a fraction of the size of larger infernos that have raged through areas of Canada and Russia since June. 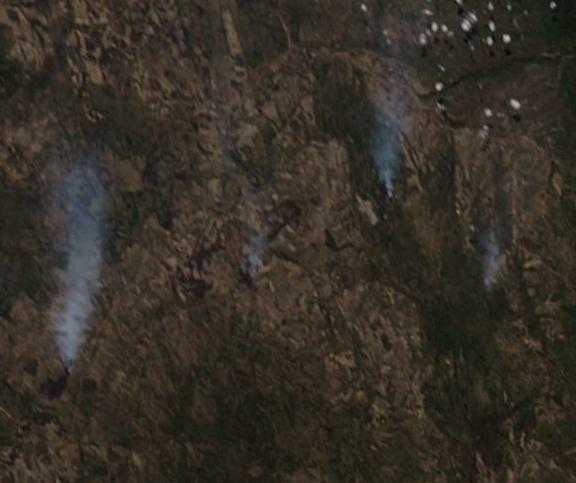 In ‘Russia Experiences Great Burning’ MODIS shots identified fire complexes and burn scars that covered 100 to 300 square miles or more (one fire burn scar measured a massive 30×70 miles). These events happened ‘off camera’ so there is no way to know if they also spawned very large fire tornadoes similar to the kind witnessed at Tetlin Ridge. What is clear from this fire and from fires across the Arctic this year and last is that the far north is burning like never before. As Russia’s eastern provinces experienced some of their worst flooding in 120 years, massive wildfires continued to burn even as the terrible rains and storm complexes advanced in an ominous Song of Flood and Fire. By now, the extent of Russian blazes has been somewhat lessened by these storms, although fire maps still show numerous active blazes. 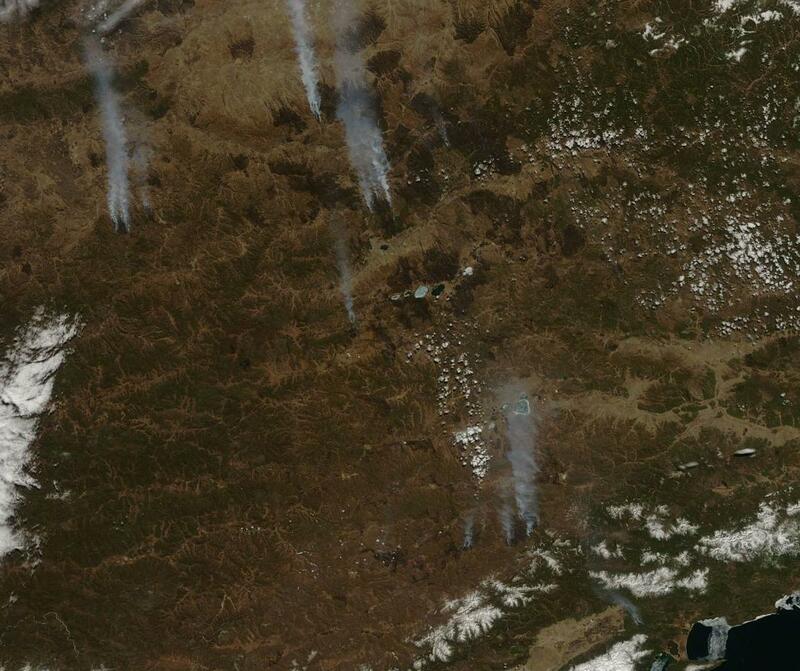 A satellite picture of the blazing ridge-line on August 15 is given below. The fire is located in the center of the image and spans about 5×10 miles of the affected ridge line. You can also see the burn scars of previous wildfires in the lands surrounding the August 15-16 blaze. Thawing permafrost, warming forests, Arctic heatwaves and more energetic storms combine to provide massive volumes of warming fuel and increasingly powerful ignition events in the Arctic. Not only can trees burn, but the organic carbon stored in permafrost and sometimes bottled up as methane beneath the surface also provides fuel. In many cases, fires have burned three feet deep into what was the permafrost bed below consuming roots, stumps and soil. 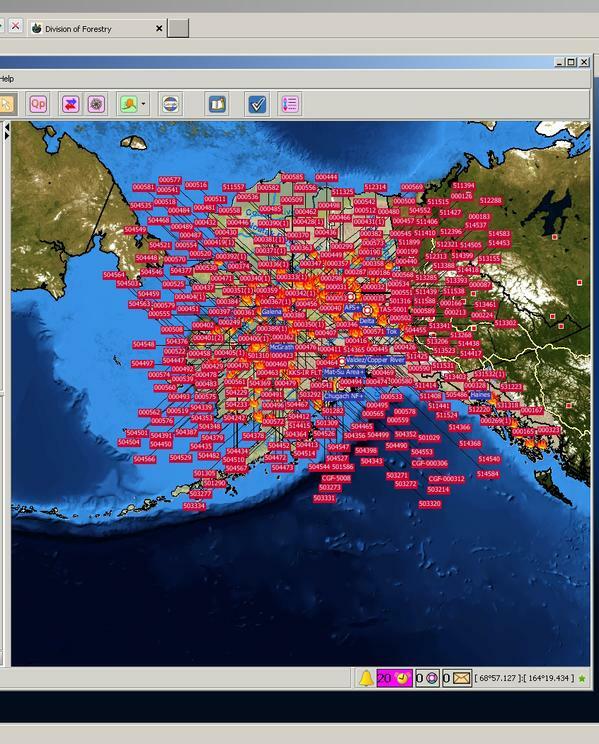 Very large and energetic fire outbreaks have been increasing throughout the Arctic with recent years seeing some of the worst fires on record. Over the past week, large tundra fires have been erupting over a section of extreme northern Canada between the Great Slave Lake and the shores of the Canadian Arctic Archipelago. With a major Arctic heatwave predicted as various extreme weather conditions arise, this region will be worth very close monitoring over the next few days. 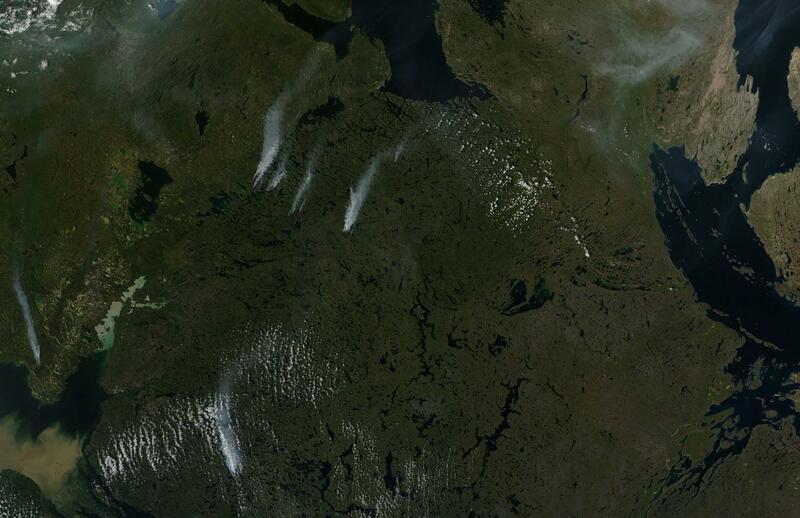 The fires are emerging in a region of the Arctic between 62 and 66 degrees north latitude, near the Arctic Circle. In the image above, we see the Great Slave Lake in the lower left hand corner, the Great Bear Lake in the upper center, and Coronation Gulf and Amundsen Bay bordering the map’s right hand side. 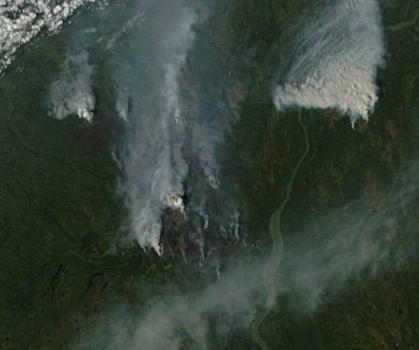 The fires are visible, along with their tell-tale smoke plumes and underlying scorch marks, in a region between the Great Slave Lake and Great Bear Lake. Terrain type in the regions burned include boreal forest and tundra. Weather conditions over the past two weeks have been both warm and dry for this Arctic region. But over the past few days, temperatures have been heating up. As temperatures rose, wildfires sparked and grew. 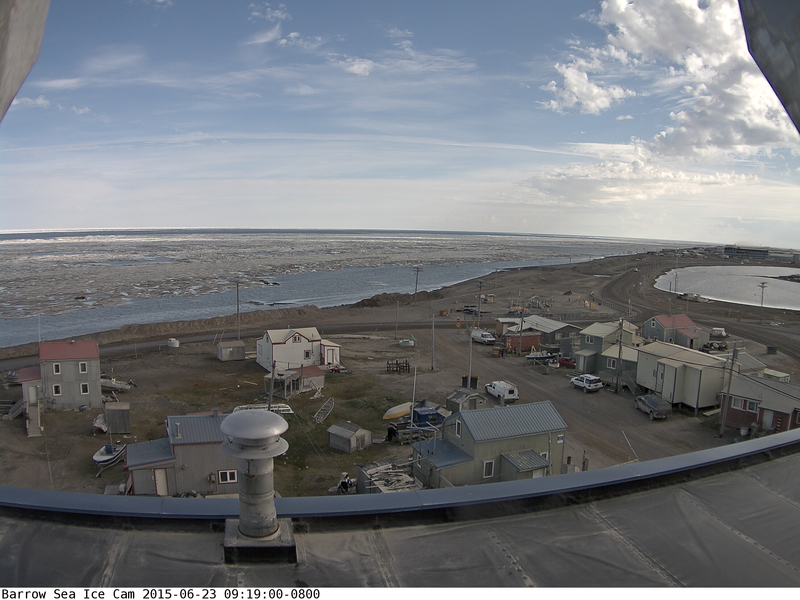 Forecasts now call for a region of very hot Arctic weather to stretch all the way to the shores of the Beaufort Sea by Friday with temperatures likely to exceed 30 degrees C (86 degrees F) over the broad stretch of land surrounding the Mackenzie Delta. This high Arctic heat pulse is being driven north by a powerful high amplitude wave in the Jet Stream which is setting up very extreme temperature differentials between the Beaufort Sea and North Canadian land masses. 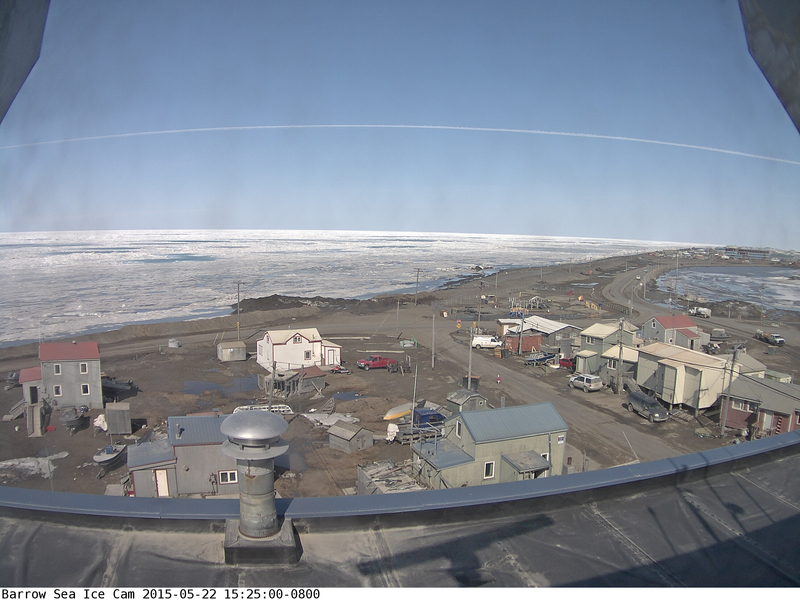 Temps over the Beaufort are now in the range of -5 degrees C in some areas (about 22 F), with temperatures over land hovering, at this time, in between 15 and 23 C (60s and 70s) and predicted to surge as high as 30 C + (86 F+). This amazing temperature differential is likely also providing fuel to a powerful 978 mb (Smokey) Arctic Cyclone now traversing from the Laptev and into the Central Arctic. It will also intensify winds and drive greater heating over Arctic land masses over the next few days. Though not as massive or extensive as the fires raging across the Arctic Ocean in Russia, these fires are still quite large — with burn marks stretching 6 or more miles at their widest point in many cases. Another region just west of the fires shown in the image above is also experiencing a very large blaze. This complex of fires is raging along the banks of the Mackenzie River and is shown to have a fire line more than ten miles across at its widest point. Note the extremely large scorch mark to the lower center portion of the map, with a large, energetic fire blazing in the upper right portion of the map and a smaller, though still substantial, blaze erupting to the upper left. As noted above, fire-conducive conditions for this region are forecast to intensify well before they moderate. So this particular spate of fires may well be just starting to ramp up. For a final note, I’d like to add the observation that this event represents a bit of rather harsh irony. 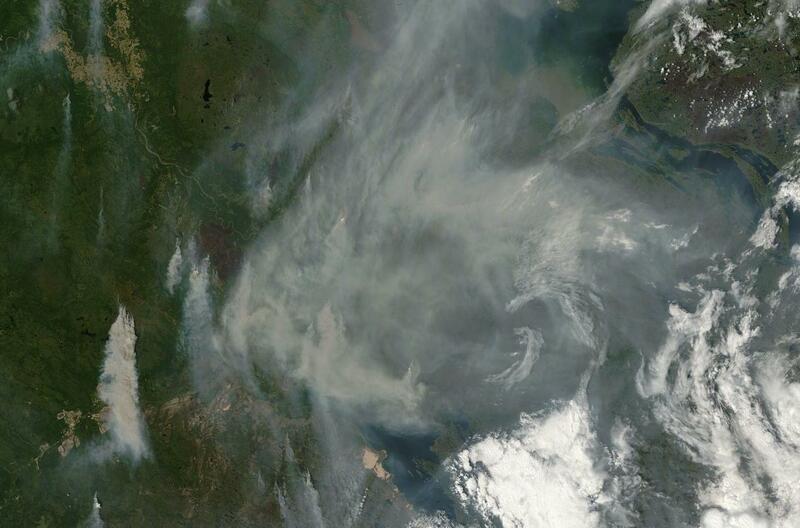 These fires now rage in a region dominated by Canada’s Tar Sands Industry. Carbon is being baked and burned out of the land and soil by anomalous heat caused by human warming and not just by the immense grind and crush of fossil fuel industry. The steps of carbon extraction, in this case, have been shortened and are now out of our control. Temperature color graphic. Areas in red indicate temperatures in the range of 77-86 degrees (Fahrenheit) but may not fully capture daily maximum temperatures. During a murder investigation, sometimes you find traces of smoke from a gun fired in relation to the crime. In other cases, sometimes you find the gun itself. Even more rarely, do you find a smoking gun dropped at a still fresh crime scene. Such was the case with the Arctic today. 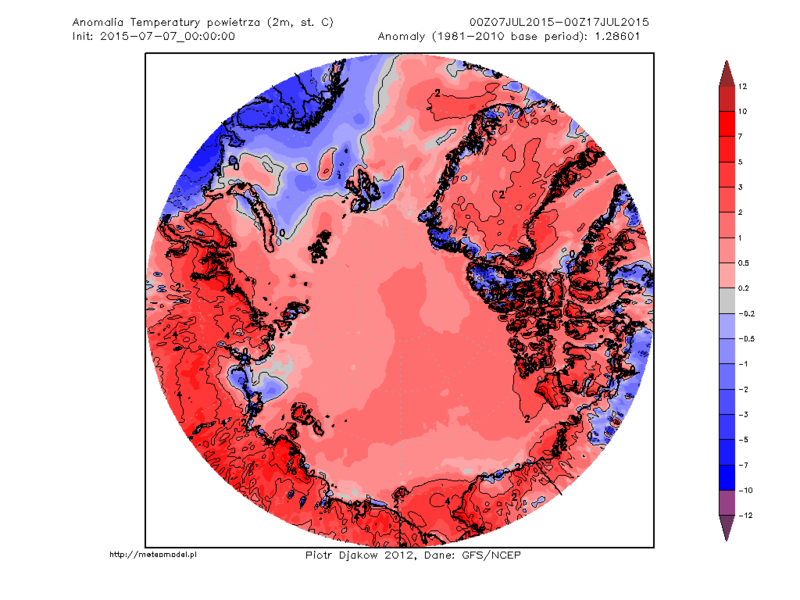 The crime scene: another anomalous Arctic heat wave. The suspect: human caused climate change. The accessory: Arctic amplification. The smoking gun: major methane emission in the Arctic. Yesterday, I reported that a large Arctic heat wave had settled over Siberia, once again setting off tundra fires. 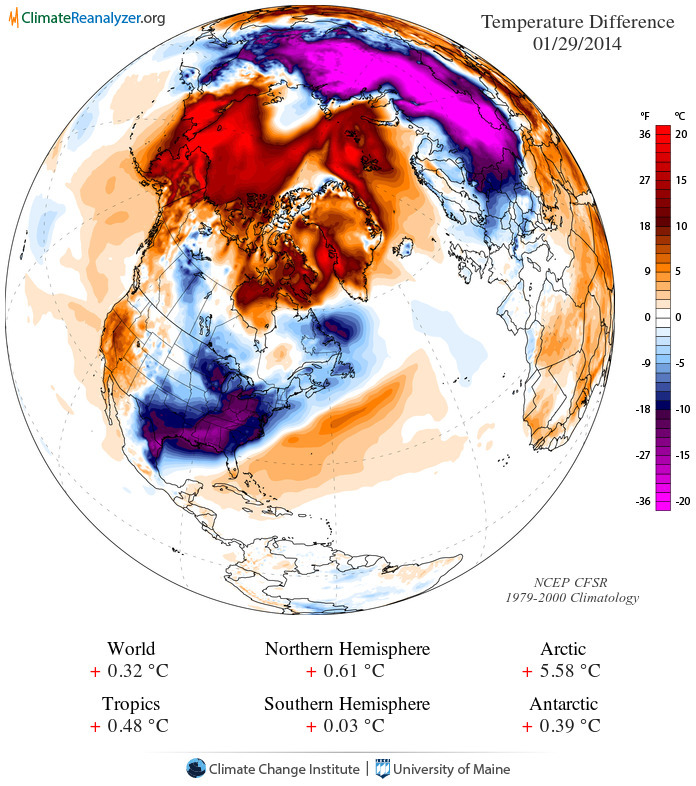 The heat wave was so intense that it pushed temperatures in a range of 77 to 86 degrees all the way to the shores of the Arctic Ocean even as it caused numerous massive blazes to emerge both on open tundra and throughout Siberia’s boreal forests. Atmospheric conditions — a Jet Stream mangled by human caused climate change and a large heat dome had enabled the formation of this heat wave. But now we find something even more ominous than evidence that human global warming is moving the Jet Stream about all while pushing polar amplification into such a high gear that the terms ‘Arctic Heat Wave’ and ‘Tundra Fire’ have now become common meteorological parlance. And that thing is a large and disturbing methane pulse. On July 21-23, a large methane emission in which numerous sources caused atmospheric spikes to greater than 1950 parts per billion flared over a wide region of Arctic Russia and the Kara Sea. This event was so massive that an area of about 500 x 500 miles was nearly completely filled with these higher readings even as a much broader region, stretching about 2,000 miles in length and about 800 miles at its widest, experienced scores of large pulses. You can see a visual representation of these emissions in yellow on the image above, provided by Methane Tracker which compiles data provided by NASA’s Aqua Satellite. As noted above, this major event coincided with a large Arctic heat wave and numerous tundra fires that raged throughout the region. Another unprecedented occurrence in a summer of strange weather and mangled climate. Average global methane levels are currently around 1830 parts per billion (Mauna Loa surface data). This level, about 1130 parts per billion higher than the pre-industrial average of 700 parts per billion represents an additional global warming forcing equal to at least 28% of the added CO2 forcing provided by humans. It has long been a concern among scientists that the Arctic environment, as it is forced to warm by human-caused climate change, would emit an additional significant volume of methane from carbon stocks locked in tundra and in methane stores sequestered on the sea bed. Since methane has between 25 and 105 times the heating potential of CO2, the possible added additional warming is quite substantial. In the 2000s, a number of Arctic researchers found disturbing evidence of methane emissions coming directly from the Arctic environment. In 2013, NASA began its CARVE mission to more clearly define the Arctic’s response to human-caused warming. Its preliminary research has found methane plumes as large as 150 miles across. Overall, the Arctic environment is already clearly adding its own methane to the global mix. We can see this in local Arctic methane measurements that average around 1900 parts per billion and above in many Arctic locations. These readings are about 70 parts per billion above the global average. This week’s large methane pulse where a broad region experienced methane levels of 1950 to 1980 parts per billion is yet more evidence that the Arctic is beginning to provide a dangerous and troubling amplifying feedback to the already break-neck pace of human warming. In total, around 2,500 gigatons of methane are thought to be locked in carbon stores both in the Arctic tundra and in hydrates (frozen methane and water) on the Arctic Ocean floor. Though a dangerous and troubling addition to a human-caused warming that is already changing the world’s weather in harmful and damaging ways, this particular methane pulse is not yet evidence of runaway global warming. In a runaway, Arctic methane emissions would likely exceed 500 megatons per year, which would be enough to raise global levels by about 150 parts per billion or more annually. Such a runaway would be a global nightmare requiring an unprecedented human response if Earth’s life support systems were to be preserved in any rough corollary to what we enjoy today. Though such an event is probably still low-risk (but perhaps as high as 10-20 percent), it cannot be entirely ruled out due to the speed and violence at which human greenhouse gas emissions are altering Earth systems. So the prudent course would be for a rapid response as if such an event were imminent. The reason is that a runaway methane emission in the Arctic would cause severe and untold damage and harm. The loss of sea ice leads to seabed warming, which leads to offshore permafrost melt , which leads to methane release, which leads to enhanced warming, which leads to even more rapid uncovering of seabed. If a large release has not occurred by 2016 the danger will be continuously increasing. It is thought that at 2-3C of global warming, which means 6-8C of Arctic warming, methane release from permafrost on land will be greatly increased. Those who understand Arctic seabed geology and the oceanography of water column warming from ice retreat do not say that this is a low probability event. I think one should trust those who know about a subject rather than those who don’t. 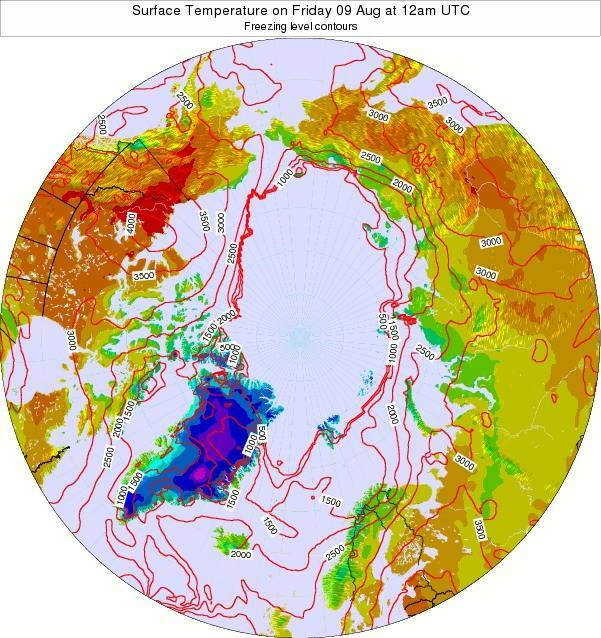 As far as I’m concerned, the experts in this area are the people who have been actively working on the seabed conditions in the East Siberian Sea in summer during the past few summers where the ice cover has disappeared and the water has warmed. The rapid disappearance of offshore permafrost through water heating is a unique phenomenon, so clearly no “expert” would have found a mechanism elsewhere to compare with this. Though most climate scientists do not currently believe that such a rapid release of methane is possible over such a short period, we do have to ask ourselves — what if Wadhams and others like him are right? In such a case we could see a catastrophic warming of up to 5 degrees C by 2050, far beyond anything mainstream models or paleoclimate would suggest. But the human rate of climate forcing that is now more than ten times anything seen during the geological record puts us in a context that is entirely out of previous reckoning. So these warnings by Wadhams should be listened to, heeded, and taken into account. (Hat Tip to commenter Colorado Bob for the head’s up on these articles). More likely, however, is that a combination of methane release from the tundra and the ocean floor and a loss of albedo (reflectivity) due to ice sheet loss will result in an effective doubling or more of the initial human greenhouse gas forcing over the coming decades and centuries. Such a response is still very dangerous in that it risks locking in, long term, already damaging changes to the world’s environments. Should the Earth System fully respond to the 400 ppm CO2 and 1830 ppb methane we’ve already achieved through our emissions , we can expect at least a 3 degree Celsius global temperature increase and long-term sea level rise of between 25 and 75 feet. Such changes would severely damage both human infrastructure and the environments upon which human-based agriculture depend for its now vast food production. In addition, a 24% increase in the hydrological cycle and a number of destabilizing changes to the world’s weather systems would cause severe added damage. A rapid Earth Systems feedback response risks these changes at current greenhouse gas levels. And since we are now seeing both methane release and ice sheet response, a level of these feedbacks are already in play, showing a far greater risk than initial forecasts indicated. Further greenhouse gas emissions risk even more damaging potentials, possibly locking in ever-greater consequences. For this reason, any global policy that does not seek to fully mitigate such new and over-riding risks by planning a complete phase out of carbon emissions is an unconscionable policy to open the door to immeasurable harm to human lives and the living systems of our world upon which we depend. These first methane burps are a warning for us to act now, before our capacity to act is seriously degraded and before events start to spiral beyond the point of rational control. We have had other warnings which we have, so far, mostly ignored. And though the responses by the Obama Administration and World Bank to de-fund new coal plants are encouraging, we should redouble our efforts now, lest we enter an age of bitter regret as the consequences of our carbon emission form a trap that is difficult or impossible to escape. Yesterday in Alaska, as wildfires raged through interior regions, temperatures rose into the high 80s (Fahrenheit). Now, during relative night-time in the land of the midnight sun, lows are hovering around 70 in many places (near record daily highs for this time of year). Meanwhile, at the Arctic’s opposite end, temperatures in the region of Archangel, near the Arctic Ocean are in the range of 90 degrees. Nearby, Finland also sees temperatures rocketing up through the 80s as a Scandinavian heatwave that began in June reasserts itself. The Arctic heatwave that started in Scandinavia then moved to Alaska and flared in Russia and Siberia has now become nearly ubiquitous. 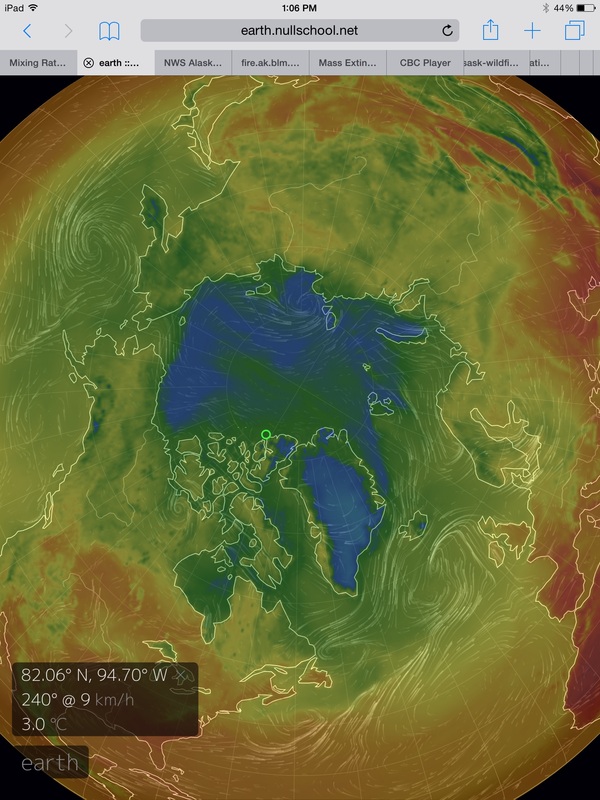 Record hot temperatures range the Arctic from shore to shore. 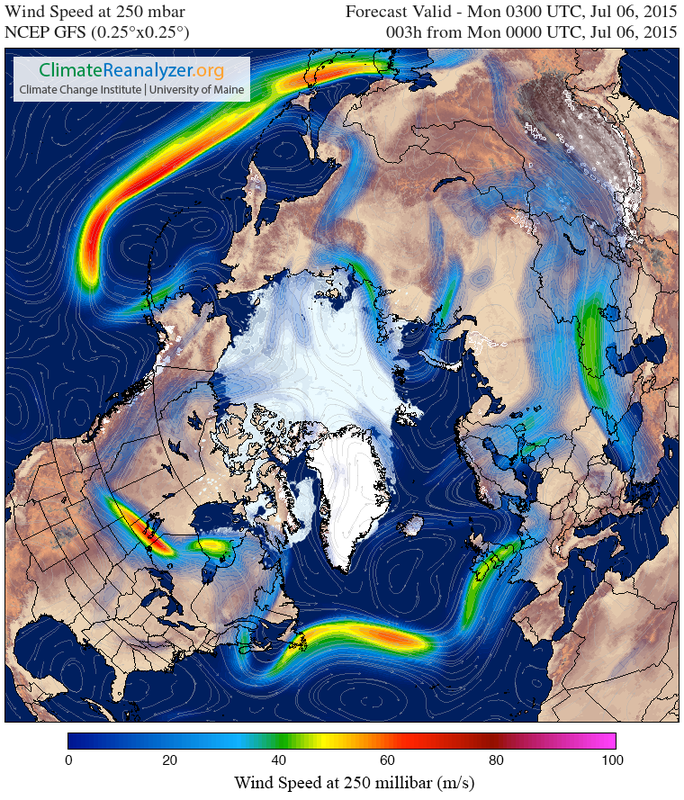 These record heat invasions have been enabled by a combination of factors that include rising global greenhouse gasses, above average atmospheric methane and CO2 concentrations in the Arctic, and a rapid retreat of snow and sea ice cover that has enabled the Jet Stream to range further and further north, bringing temperatures from more southerly climates with it. As a sample, atmospheric CO2 is now at about 403 parts per million at Barrow Alaska, while methane levels are around 1890 parts per billion. These levels are about 4 parts per million and 60 parts per billion above current global average CO2 and methane levels respectively. Higher levels of these heat trapping gasses in the Arctic are a direct result of environmental emissions sources including thawing tundra, melting permafrost, and destabilizing frozen methane on the Arctic sea bed. Together, these sources result in substantially higher levels of almost all greenhouse gasses over a broad range of the Arctic. Both these features continue to bring much warmer than normal conditions in regions beneath their influence. The Scandinavian blocking pattern has been particularly persistent, with weather impacts stretching all the way back to early June. One last feature of note is a cut-off upper level low just off the Pacific coast of British Columbia. This particular low pressure system was the one that resulted in so much flooding over regions of Alberta and Calgary last week with rainy conditions persisting through today. A large band of clouds and rain storms continues to stream off this low, dumping more un-needed moisture over central Canada. Among today’s impacts was the flooding and shut-down of a meat-packing plant, yet one more ding to the world’s food supply. ECMWF forecast models show this rough configuration of the Jet Stream remaining in place at least until July 6th when the Scandinavian blocking pattern begins to stage a major warm-air breakthrough to the Central Arctic. At the same time, a large trough of low pressure systems emerges again over regions of Alberta and northern Canada as a ridge of high pressure shoves what remains of PAC 2013 over Greenland and comes to take tenuous hold of the Central Arctic. Note the above freezing 5,000 foot temperatures plunging all the way through the Central Arctic (which should translate to around 40-45 degree [F] surface temperatures). It is also worth noting the large pulse of warm air riding all the way up to the Canadian Archipelago ahead of the developing trough. This forecast is still very far out, so we’ll have to keep watch for any changes. Yet given the history of summer 2013 Arctic weather, it appears likely that the ongoing extreme configuration of the Jet will result in more unusual events. 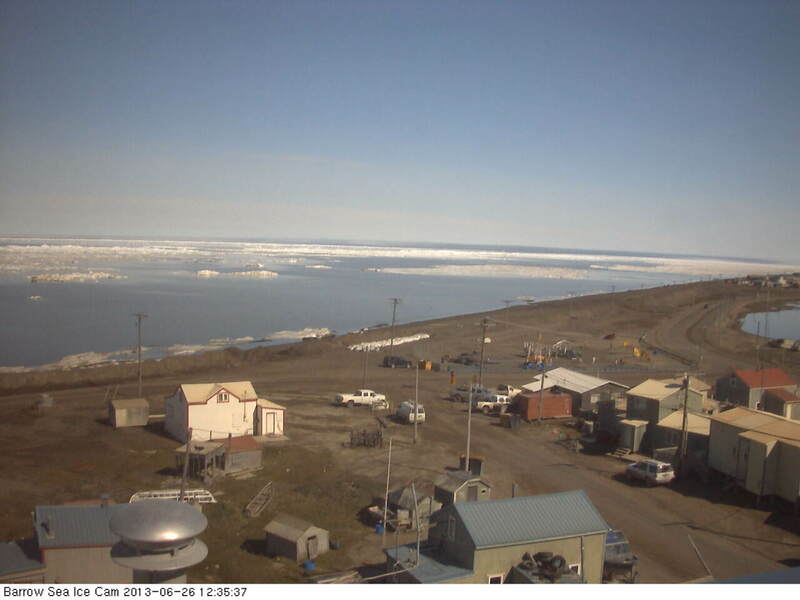 As a final, I’ll leave you with this picture of the expanding open water at Barrow, Alaska. Note that the off-shore ice has been gone since June 24th.